After 44 years - on 18th.09.2014 - I decided to stop my researches on: "How were all continents discovered 1885-2014 by motorcycle-travellers?" The reason is that I have been sitting with all my passion behind the computers and reading books and articles for years day and night to come to the knowledge of these sites. I am still full of other ideas including some travels. Also I want to move a bit more for my health instead of sitting too long behind the computer. You can use all information for yourself. If you use infos and fotos for any other reason like publications please know, that there is still Copyright on all of it by myself and others. I am German. I did my best to write most in English. If I missed some ,,,,,,,,, please take some of these and put them on the right place (Churchill)! Aybovan (Shingalesisch). Bem Vindo ! Benvenuti ! Boyeyi Malamu (Lingala). Buenvenito (Italian) ! Bien Venido ! Bienavenue ! Bienvenue (French) ! Bom Bini ! Dobrodosli ! Huan yin (Chinese) ! Julley (Ladakh)! Namaste ! Shalom (Hebro)! Tanastalink ! Tashi Delek (Tibet)! Terv etuloa (Finnish). Välkommen (Swedish) ! Velkommen (Norwegian) ! Welcome (English)! Welkom (Dutch) ! Willkommen (German) ! ! = >1350 Motorcycle-TRAVEL-Books in a date-base. 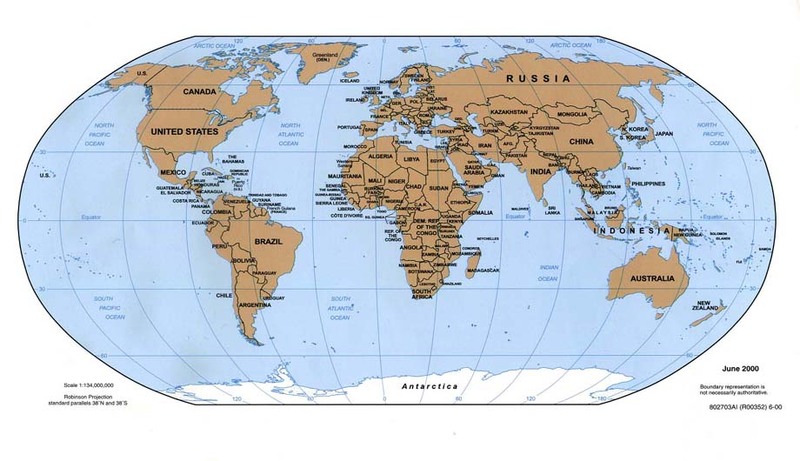 Here look in the columne "continent" under Around-The-World. How to see and print out (free of charge) or to buy maps for your mc-tour ? Do you know this in other languages? Copyright Bernd Tesch.Expert for Motorcycle-WORLD-Travels. It is free for you to read this and learn out of it. It is not allowed to take off or to publish any information of this without written permission of Bernd Tesch. This all is a part of the book in work "Motorrad-Welt-Reisen" = Motorcycle-Travels Around-The-World. ISBN 3-9800099-8-x. If you are a World-Around-Traveller or plan to do this or "on the road" already or know anyone who is not listed here, please send my any details, addresses, publications, homepages and most important: best pictures. Sven Müller (German, born-date??) and Susan Smith (British, born-date??) your http://www.??? 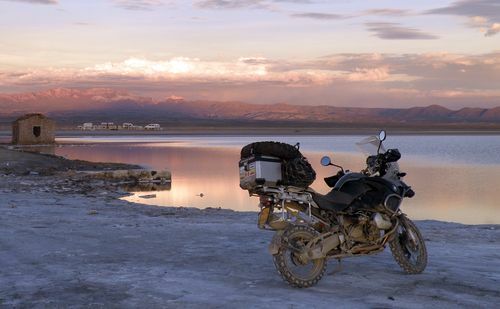 Solo Around the World with BMW R 100 GS. 50.000 kms. Sven rode together with Susan Smith (British) who rode a HONDA 500 XL. Purpose of your tour: ..?? Mike Matteson. 2005. Leaving the door. Mike Matteson "on the road" in Russia. Mike Matteson (American born 28.4.1940 in Washington State). www.rtwrider.net. + Around The World 2005. 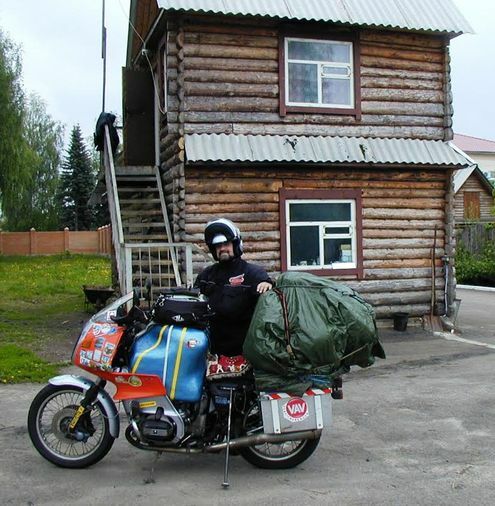 Mike rode solo, unsupported and unsponsored around the world riding a 2004 Kawasaki KLR 650 3,665 miles (by bike), 6990 miles of this being in Russia.?? kms ??. I call this ride "around the world made as simple as possible" as only one country (Russia) required a visa, none required a carnet de passage, and borders between the European Union countries were open and could be easily crossed. I thus avoided most of the paperwork and border crossing difficulties that many around the world riders encounter. The route was paved (some of the pavement in Russia was in very poor condition but in many places it was excellent) except for about 1200 miles in the Amur region of Siberia, where the Trans-Siberian Highway is still under construction (in 2005). Purpose: Fulfilling a dream of riding around the world I had since I began riding motorcycles in 1968..
Route: North America (USA) - Asia (Russia) - Europe (Latvia, Lithuania, Poland, Germany) - North America (USA, Canada, USA). The best: The personal satisfaction of fulfilling my around the world dream and doing it alone, without any support. Also the kindness and help of the Russian people, who almost without exception did their best to help me the many times I asked for assistance in finding my route. The worst: Arriving in Russia and finding all my GPS mapping had been, for reasons unknown, erased. This, along with my inability to read the Cyrillic alphabet road signs, made navigation extremely difficult Also my inability to communicate in Russia because of my extremely limited grasp of the Russian language. - Lost of fotos after Mike came home. Useful tips for others: Take two GPS units containing appropriate map downloads, put one in your checked luggage and carry one on your flights. Research any possible reasons why GPS mapping would be erased in airports or during flights and do whatever is possible to avoid it. If you are spending a lot of time in Russia either learn as much of the Russian language and Cyrillic alphabet as possible, or take along someone who is fluent in Russian. 09.09.2014 First information by Clement Salvadori. 10.09.2014 First email from B.T. To Mike Mattesin. 11.09. 2014 First answer by email with just his website. 11.09.2014 First request for update. The two best fotos. the map of the roas he has realy done. Nick Sandfers (C). Design B.T. 2013. + Around-The-World second time by motorcycle. Journey Beyond Reason. World-Record: Solo in 19 days 19.604 miles on land with a motorcycle YAMAHA R1. Purpose: To regain my world record as the fastest circumnavigation by vehicle. I had to average over 1000 miles each day to accomplish this. Having just got divorced and with 3 small children under 7 to support I needed sponsorship and I needed to sell a book and film very quickly. I was 3 months from losing my house and business. The Route: 19 604 miles around the world. Across Europe to Asia (Istanbul - fly to Mumbai, ride across India to Calcutta via Bangalore, ride down from Bangkok to Singapore and fly to) Australia (Perth, ride up to Broome and then Katherine and over to Brisbane and down to Sydney, fly to Christchurch and ride to Auckland, fly to Anchorage and ride down to San Antonio and over to) North America (New York) and fly to Europe (London). The Best: I got the record before of 19 days by 4 hours and considered not stopping and doing a second circumnavigation non-stop. Important Useful Information for Others: Try and not get divorced - do anything you can to prevent this, it is harder almost than dying. But, if it happens, grieve quickly and efficiently - try and get over the pain in a week and not the 4 years it took me. Remember, new love returns in the most unexpected ways. Also, if as I am, a single parent father, you can still motorcycle around the world - I continued to achieve records including a double transit of the Americas in 46 days non-stop. Book or publication: Journey Beyond Reason (ISBN 0-954908112, 2005). Available through www.nicksanders.com. A concise explanation of how a desperate situation turned into a triumph. Not designed but sold 10 000 copies in 8 months. I saved my house from the bank, fed my children well and we sometimes feasted and watched films late into the night. 1984: Nick Sanders set the original record in 1984, riding over 13,000 miles (20,900 km) around the Northern Hemisphere in 78 days. In 2003, Guinness changed the rules to require a journey of at least 40,075 kilometres (24,900 mi) in total, of which at least 28,970 kilometres (18,000 mi) must be cycled, via two antipodal points. The changes invalidated Sanders's record. Sanders still holds the Guinness World Record for fastest ride around the coast of Great Britain, riding a verified 4,800 miles (7,720 km) in 22 days. Nick Sanders (1984-09-14). 22 Days Around the Coast of Britain. ISBN 0-946940-03-7. + Around-The-World first time by motorcycle. World-Record 19.930 miles in 31 days and 20 hours. World-Record 19.604 miles on land in 19 days. 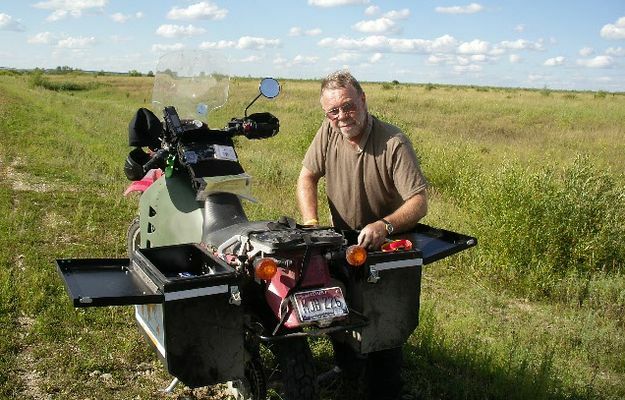 Nick Sanders is a British bicyclist, motorcyclist and author noted for his long-distance riding. On 9 June 1997, Sanders completed a world record 19,930-mile (32,070 km) circumnavigation of the world in a record riding time of 31 days 20 hours. Sanders, Nick (1988). The great bike ride: around the world in 80 days. Ashford Press. ISBN 978-1-85253-228-4. Sanders, Nick (1989). Short summer in South America. Ashford Press. ISBN 978-1-85253-201-7. Sanders, Nick (1999). Fastest Man Around the World. On the Road. ISBN 978-0-9537290-0-5. Sanders, Nick (2004). Loneliness of the Long Distance Biker. On the Road. ISBN 978-0-9549081-0-2. 1. ^ Jump up to: a b Inman, Gary (6 July 2002). "Man with a global view". The Daily Telegraph. Retrieved 25 March 2010. 2. Jump up ^ Guinness World Records 2001. Guinness World Records Ltd. 2000. p. 34. ISBN 978-1-892051-01-1. 3. Jump up ^ Brace, Matthew (3 August 1995). "Wide horizons of the narrowboat adventurer". The Independent. Retrieved 2 August 2010. 2005 First info by Nick Sanders personally. 31.12.2013 First reqest for update. 08.05.2005 - not finished yet 22.02.2008. still 5 years to go. - Plan Around-The-World.Gionata rode already 110.000 km until 22.02.2008 with a Honda Translap XL600V 1987 which he bought for 800 Euro. Route in 2005: 22.000 km. Europe (italy, slovenia, croatia, bosnia, montenegro, serbia, kosovo, macedonia, greece, turkey, georgia) Asia (russia, japan). Route in 2006: 39.000 km. Asia (south korea, china (bike shipped to thailand), vietnam, cambodia, laos, thailand, malaysia, singapore, indonesia (bike shipped to australia). Australia. Route in 2007: 26.000 km. Australia (bike shipped to new zealand), new zealand. Highlights : I wanted to test my limits. Know reality in other countries. Know people. Show other people what the world is and teach them what the world taught me too. The worst: Got close to be robbed by kurdish in turkey. Got close to die in russia. Got close to fight in russia. Got close to be eaten up by tigers in indonesia. Book or publication I count 12 milions viewers on my site. I write for italian and australian magazines and web world wide magazines. I do radio interviews. I already have some book publication offers. I am testimonial for 6 brand so far. I HAVE NO SPONSOR OR MONEY FROM those brands!!! 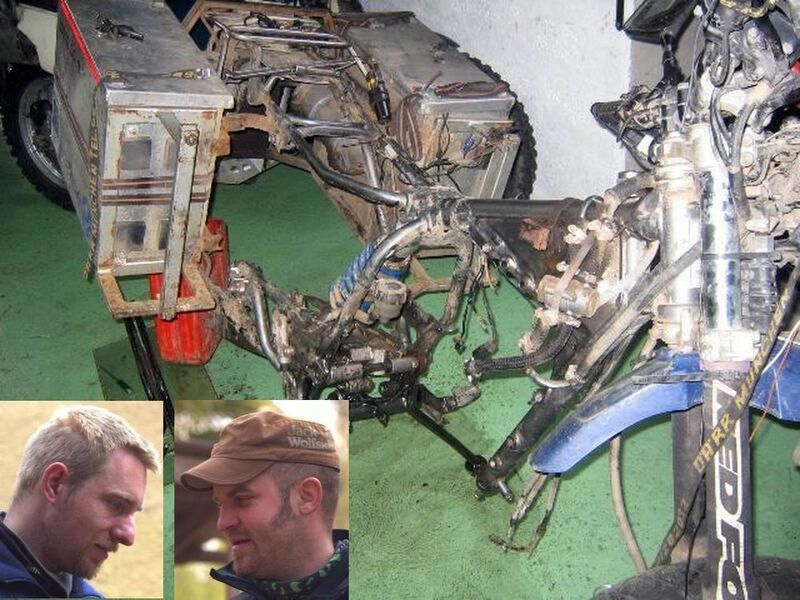 Earlier Experiences of big Motorcycle-Tours: I am not a mechanic. And still im not. I left with 2000 Euro in 2005 and I spent 14.000 euro in 2 years all included. I work my way around doing any kind of job. 21.02.2008 1st request for update. 27.03.2012 Please send the update for your blog and the very best foto of you (with the red eye) and with the bike "on the road". Helmut Kunkel in Siberia . 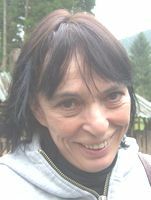 Foto H.Kunkel (C). + Around-The-World. 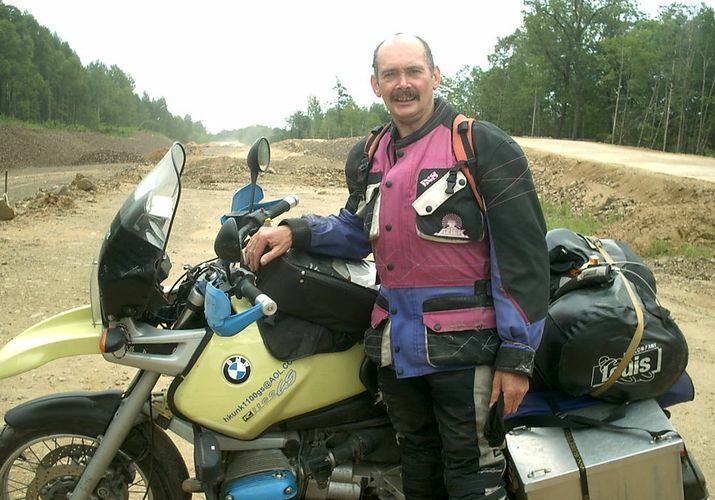 Helmut rode solo Around-The-World with BMW R 1100 GS. 33.000 km (Machine Start: 91.000 km. End: 124.000km). Purpose of your travel: a Dream and for my interest. Route: Europe (by plane from Frankfurt to) - North America (Bosten, USA to Wakefield Canada 2000 km - Wakefield to Chicago to San Francisco 10.000 km) - by plane from San Francisco to Asia (Tokio in Japan, in Japan- Narita 2000 km - by ferry from Fusiki to Russia, Vladiwostok - overland to Mongolia) - Europe (Ukrain, Poland, Slowakia, Rep. Tschech - Partenstein, Germany 19,000 km). Book or publication: I think my book will be ready in 3-5 months existing out of my letters. In april 2007 I got the information that I will be infomed about the book when it is ready.Useful / important informations and TIPS for others: ..Please Contact me..
17.04.2006 1st information about his tour 2005 RTWorld. 17.04.2066 1st request for update. 21.04.2006 Participant of the 28th Mc-Meeting for World-Travellers. One of 8 present being Around-The-World travelers. 09.05.2007 Helmut informs be that in two weeks his book will be ready. 15.04.2007 Book: Kurs West. Mit dem Motorrad um die Welt. Ratgeber und Erlebnisbericht. Betina Peters Verlag. Germany ISBN 978-3-935691-69-4. 09.05.2007 B.T. informed Helmut about the 50th. Tesch-Globetrotter-Meeting 25th.-27th.04.2008 with the main subject: Around-The-World. 19.03.2010 Helmut informiert mich, dass der in 2009 N- und S-Amerika bereist hat. Habe ihn um Zusammenfassung gebeten. 2010. Arno Baumer (links) am Ende des Alaska Highways. 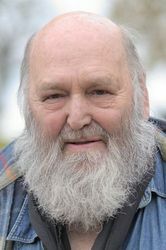 Rechts: Gerald Bauer (Foto, C). 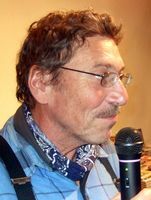 Arno Baumer at the "Tesch-Travel-Treffen" in 2009. Fotos B.T. + Around-The-World. 12.000 kms solo Around-The-World with a HONDA Transalp (Bj.2002). Route: Europe (Germany (Burgau near Ulm) - Poland - Lathvia - Estland - Lithuania - Asia (Russia - (Pertersburg - Moscow - Nirninowgorod) - Kazakstan - Kyrgystan - Kasachstan - Russia (Lake Baikal) - Mongolia - Russia (all the way by road to Wladiwostok) - by ferry to South Korea by train to Kambodcha - Thailand - by air to North America (USA (Los Angelos - Chicago)) - by air to Europe (Germany (Frankfurt)- Burgau). Highlights: Meeting of friendly people, especially in Russia. Joy about the own effort (Arno has a paper as kidabeld man). Afterwards free of his deep depression before. Earlier experiences: I rode through all this countries by motorcycle: Albanien. Andorra. Argentinien. Belgien. Bolivien. Bosnien. Herzegowina. Bulgarien. Chile. Costa Rica. Dänemark. Equador. El Salvador. Estland. Frankreich. Georgien. Griechenland. Großbritannien. Guatemala. Honduras. Indien. Irland. Italien. Jordanien. Kambodscha. Kasachstan. Kirgistan. Kolumbien. Südkorea. Korea (Süd). Kroatien. Lettland. Liechtenstein. Litauen. Luxemburg. Marokko. Macedonien. Mexico. Moldavien. Monaco, Mongolei. Montenegro. NIcaragua. Norwegen. Österreich. Panama. Peru. Polen. Rumänien. Russland. San Marino. Schweden. Schweiz. Serbien. Slowakei. Slowenien. Spanien. Syrien. Thailand. Tschechische Rep.. Tunesien. Türkei. Ukaraine. Ungarn. USA. Venezuela. Arno travelled through a lot of other conutries as well by foot, auto-stop etc. 6 months. North- and South America. 6 months: Germany - Sweden - Jordania - Germany. 2011: Route: Germany- Belgium- France- Spain- Portugal- Spain- France- Switzerland- Germany. Flight to Mombasa- Tansania- Malawi-Sambia- Botswana- Namibia- South Africa- Lesotho- Capetown - back to Germany. Bike by ship. I flew back by plane. 2012 Belgium- France- GB- Isle of man- GB- France- May be with my son Balkan- Bulgaria- Istanbul and back may be int he autumn Turkey-Iran- Oman. 02.02.2010 1st request for update. 30.04.2010 Arno intends to come to the 52th. Tesch-Travel-Treffen again. Then to Sicily >Canada > Alaska > WEstcoast USA, Nationalparks and in autum back to Canadas Indian summer. 30.03.2010 Next request to answer the ?? 09.12.2013 Next request to answer the ?? and to send max three best fotos of him and the mc on tour. 31.03.2015 Arno Baumer aus Ulm. So nebenbei erfahre ich „2014 Rundresie im Iran gemacht, wo ich 1969-1970 ja schon auf dem Hippietreck über Afghanistan nach Indien war…“ Oder: „Dieses Jahr lasse ich es ruhiger angehen: D – Polen- Weißrussland – Rundtour durchs Baltikum – Island – Faröer -. Dann brauche ich etwas Wärme, deshalb weiter nach Spanien, wo ich eine lange Liste von alten Kirchen abhaken werde..
31.03.2015 Last update with foto. 24.-26.04.2015 Participant of the 57th. Motorcycle-Meeting for worldtravellers in Malmedy/Belgium..
+ Europe - North America - South America - Africa - Asia - Europe. 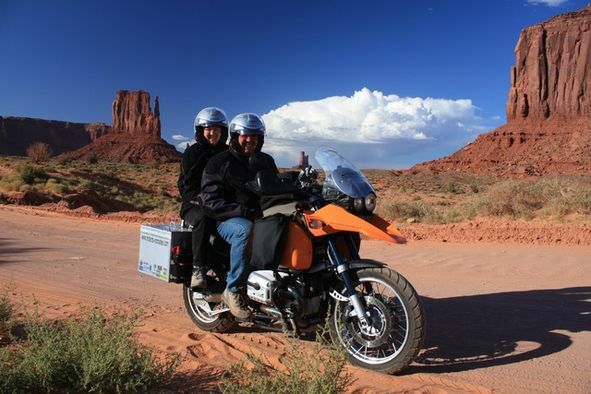 Katrin (BMW F 650) and Ralf (BMW R 100 GS and BMW R 1200 GS) rode 80.000 kms in 5 continents through 31 countries. 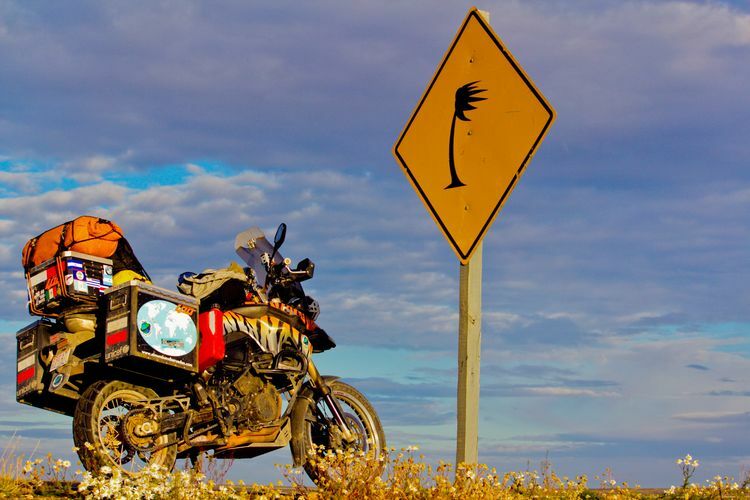 Purpose of travel and the story : Ralf planned to realise his big dream to ride solo Around-The-World with a BMW R 100 GS and open end to learn more about people and life. He wanted to start in june 2003 already. While preparing his motorcycle in 2004 in his garage he met Katrin. And fall in love with her. But Ralf finally started alone. On Ralfs tour already they met again for a vacation in Greece. Ralf rode on until the Syrian border for which he only had a one-way-visa and could not go back. During a telephone call just before he realised that he would not like so much to travel alone anymore and prefer to ride together with Katrin. Because she agreed Ralf rode back to Germany. Katrin did not have so much experience in overland riding. So they decided to travel in much more easier countries like the Americas for one year. 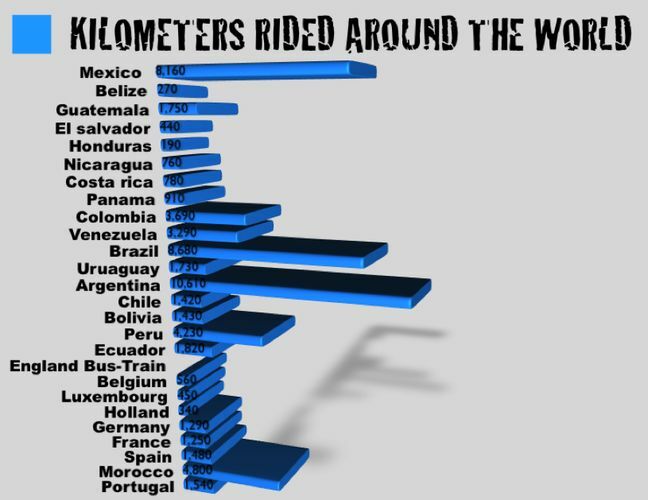 But after riding both Americas they decided to make "14 days holidays" in Germany and to fly then to South Africa. Finally Katrin (BMW F 650) and Ralf (BMW R 1200 GS now) transferred Africa and rode back to Germany another year. Katrins first purpose was to find ou for one year if they are the right partners. Route-plan: Ralfs first plans: Africa - South-America - ?? Second plan: Germany > go east. Route-done: Both flew from Europe (Germany) - to North America (USA (Seattle) with two bikes - Canada - USA (Westcoast - Baja) - Mexico - Guatemala - Honduras - Nicaragua - Costa Rica - Panama) - by ship to South America (Colombia (Catachena) - Equador - Peru - Bolivia - Chile - Argentina (Bueneso Aires). BMW F 650 by container-ship to Africa (South Africa (Capetown)) - Katrin and Ralf flew with the BMW R 100 GS and not wrking gear-box by plane to Europe (Germany). After 14 days of "vacation" in Germany both flew by plane to Africa (25.07.2006 South Africa ( Capetown) with a used BMW R 1200 GS. Overland South-Africa - Namibia - Botswana - Zambia - Malawi - Tanzania - Kenia - Ethiopia - Sudan - Egypt - Asia (Jordania - Syria) - Europe (Turkey - by ship to Greece - by ship to Italy - Austria - Germany). The Best: Katrin: British Colombia. Namibia. New people, culture and to ride in different ares like desert camping. Firemaking. Outdoor. Ralf: A frog in my boot. The Worst: To get spare parts. Organisation of Visa in Africa. Ralf: A sea passage from Panama to Colombia with bandits. Earlier experiences: Katrin rode before only on tamac. Ralf rode in Europe. Useful tips for others: Katrin: "Good prepation. I would take the same BMW F 650. Good quality of equipment but: Less is sometimes more. I would travel the same way and the same style. Most important with Ralf !!" 17.-19.04.2009 Slide-show: "Nach den Amerikas kam Transafrika" mit zwei Motorrädern. Auch eine Liebesgeschichte! Katrin wrote the diary while Ralf made most of the fotos. 27.09.2002 Nun ist es endlich soweit: Ich habe mit meinen Vorbereitungen für meine Motorradweltreise begonnnen. Diese, so der Stand heute, wird im Juni 2003 starten. 22.- 24.11. 2002 Took part in Tesch-Survival-Training. 03.10.02 1st request for update. 28.02.03 Participant of the "25th Motorcycle Meeting for World-Travellers 11.-13.04.2003"
22.07.2006 Ralf (travelling with Katrin in America) wants a rack for a 1200 GS in future. He wants to travel in Africa with this bike. The best: I expect this to be found in Russia. Book or publication: Nothing planned. Maybe inspiration will be found on the trip. Earlier experiences of big motorycle-tours: Travelling in Western Europe and the countries about to join the EU only. 2004 - Gary Mitchell, Stuart Ashby and Stephen Aldridge were participants of the 25th Motorcycle Meeting for World-Travellers. 25.04.2004 I have to make research of a group of three who started together surrounded the world as a group of three. Of course this trip could be made in a year but "normally" this route is too long for ONE year. - Around-The-World. 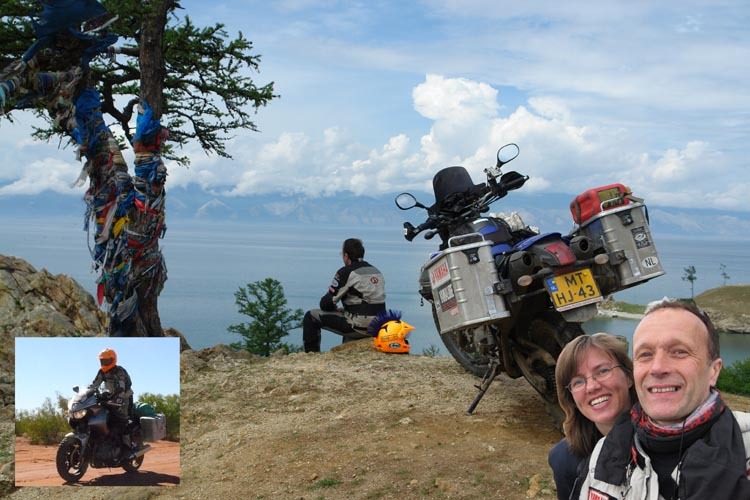 Elke and Chris ride Around-The-World with two Honda Transalps in one year 35.000 kms kms. Route : Europe (Belgium - Luxemburg - Germany - Czech Republic - Slovakia - Hungaria - Romania - Bulgaria - Turkey) - Asia (Iran - Pakistan - India - who did you fly / ship to Malaysia ??? - Thailand - Cambodia - Laos (- Thailand - Malaysia ) - ?? Planned ?? continent and countries ?? Motorrad kaputt. Tesch-Träger und Tesch-Travel-Taschen heil. 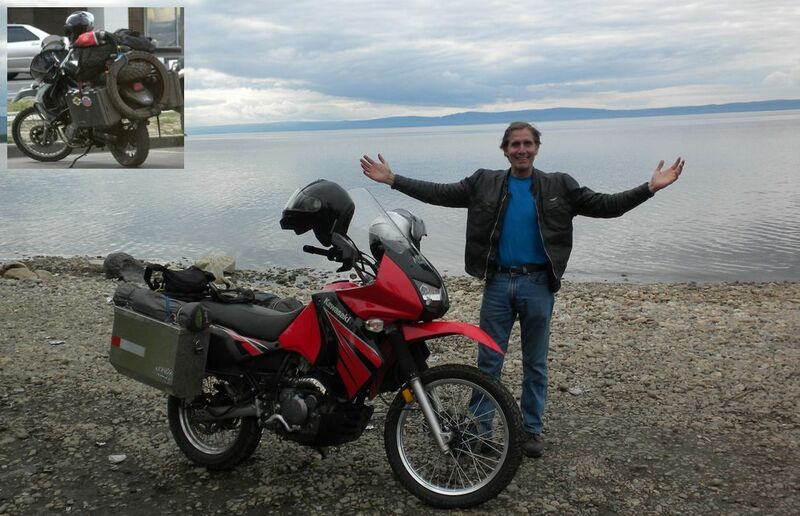 Planned Around-The-World.Bernd and Christian planned to ride together Around-The-World on two Yamaha XT 600 E 3TB. Purpose: Now or never! - Freedom - only ride eat and sleep. - But "on route" they decided after Trans-Africa and Trans-South-America to come hoem for financial reasons. The worst: 30 flats / punctures of Christian in the back-wheel. Useful informations and TIPS for others: ?? 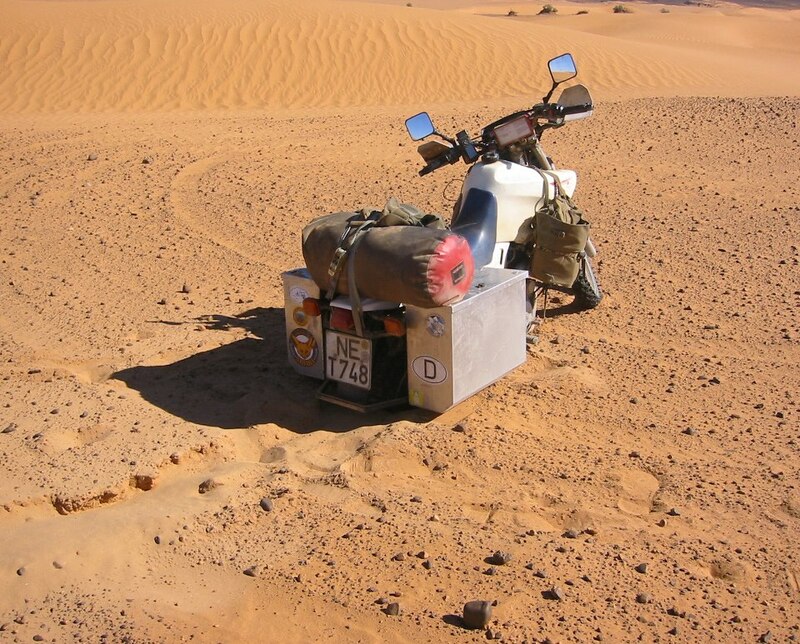 Earlier Experiences of big Motorcycle-Tours: Bernd solo to North-Africa with BMW R 1100 GS. B.T. 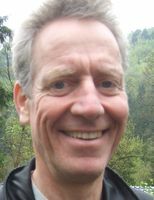 : Bernd Thiel has become a very friendly mc-traveller visiting us as well for personal reasons. I wish both of them a wonderful trip ! 05.05.2005 Bernd and Christian have been here for recommendation. 23.07.2005 Abschiedsfete von der ich leider nichts wußte. 02.2006 In Santiago de Chile gibts es fuer alle Motorraeder Teile sowie Reifen. 22.02.2006 Bis jetzt sind wir in 508 Stunden 33.000 km gefahren. Dabei haben wir 18 Laender gesehen. 15.-16.06.2006 Bernd and Christian arrived here at B.Tesch bevor they finished their trip 17.06.2006: So far 47.000 km trough 30 countries in 11 months. - Plan Around-The-World. Fred plans to circle solo the world in some steps. 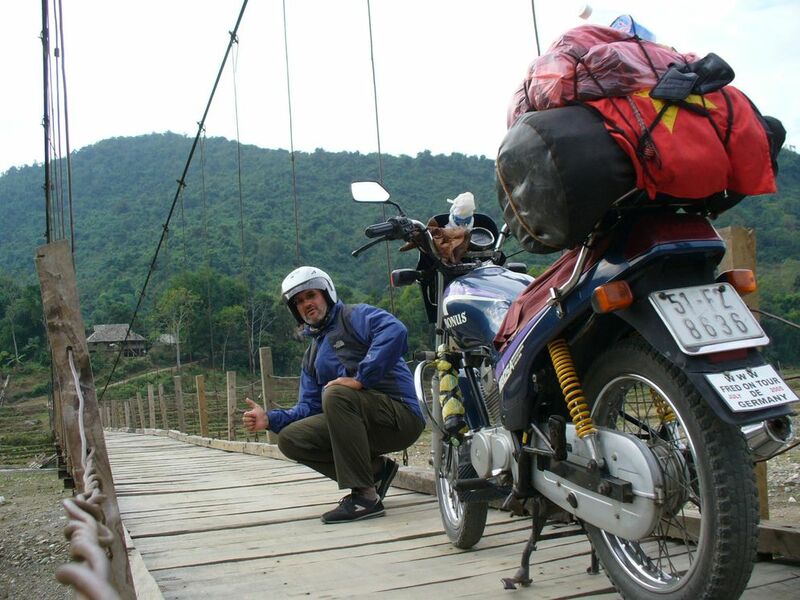 Until 05.05.2005 being in mae hong lon Fred has done 40.000 kms on his BMW R 100 GS. 2005. Partcipant four times between 1996 and 2005 of the Tesch-Traveller-Meeting ! 05.04.2006. 1st information by Fred from Malaysia ( Kuala Lumpur) after I knew already from others that he is "on tour". 05.04.2006 1st request for update. Route-Plan: Europe (Germany - polen - litauen - lettland - russland - georgien - tuerkei) - Asien (iran - pakistan - indien - nepal - indien - bangladesh - indien - sri lanka - malaysia - thailand - laos - vietnam - kambodscha - dann runter - thailand - malaysia - indonesien - inselhopping nach bali - timor?) nach australien rueber, dort die regenzeit zu verbringen, meine bmw dort lassen, weil mein zielort einmal australien sein soll, dann per flieger nach taiwan ein mopped leihen, flug nach suedkorea, ebenfalls mopped leihen, dann flug nach japan, ein mopped kaufen, einzylinder (besser fuer afrika), dann nach russland, vladiwostok, mongolai, ueber zentralasien retour nach europa, deutschland, evtl. mein erstes buch herausbringen fuer den ersten part meiner weltreise, dann weiter nach afrika kreuz und quer, 2te buch rausbringen, dann suedamerika komplett hoch nach norden, canada, alaska, von dort verschiffen nach brisbane australien, wo ich mir ein neues leben aufbauen will oder meine rente geniessen kann, wenn ich bis zu 2026 unterwegs sein kann? und an mein letztes grosses abenteuerbuch zu schreiben ueber die erlebnisse meines motorrad lebens seit 1979, ja bernd wie du siehst ist dies ein groesseres unterfangen, nicht so einfach zu ueberschreiben in dem mueller text, aber dies ist nicht wirklich planbar ist nur erdacht das ich es so machen will, mal sehen was daraus wird, wie du selbst weisst in deinem urgrossvaeterlichen reisenleben, kommt es immer anders wie geplant, du als guru der weltreisenden weisst wovon ich spreche, wenn du mich fragst was ich nach diesen ersten 10 monaten am meisten vermisse, nein es ist keine frau sondern dein treffen? Gefahren bin ich bis 29.10.2006 mit der BMW fast 47.000 km, mit dem Fahrrad in Vietnam 1000km, mit der kleinen 125er bis jetzt 1.500km in Vietnam. Info zu Vietnam: Das mit dem kleineren Grenzuebergaengen kannst du in Vietnam,auch vergessen. Ich war an der Cao Treo Border, Lao Bao Border und Moc Bai, dort laesst man keine grossen Moppeds mit Touris durch: 150ccm ist die Grenze. 05.05.2006 second request for update. 27.10.2006 Fred Klein aus Hue in Vietnam: das aussitzen an der vietnamesischen Grenze kannst Du vergessen, Auslaender mit Moppeds ueber 150ccm duerfen nicht einreisen, habe mir eine kleine 125ccm Maschine gekauft, meine R 100GS steht in Kambodscha bis Januar,2007. 11.07.2007: Mein zweites Reisejahr geht dem Ende zu. Ein neues Lebensjahr beginnt. Ich moechte Euch allen Danken fuer Eure Mails, Gastbucheintragungen, Hilfe von zu Hause aus und .... Eine kurze Auflistung von Zahlen: Indonesien ist Land Nummer 20ig fuer mich, gefahrene Kilometer mit der BMW seid Reisebeginn 55.000; geradelte km mit dem Fahrrad etwa 2000; zusammen 10.000Km mit gekauftem Mopped 125ccm in Vietnam und gemietetem in Burma. Flugkilometer etwa 6000. Wasserwegskilometer etwa 2000. Bus Km 1.000; Eisenbahn Km etwa 350; Benzinverbrauch auf 65,000 Moppedkilometer in 2 Jahren, wobei die BMW davon 7 Monate unbenutzt waehrend des Vietnam-, und Burma Aufenthaltes stand, incl. den 125ccm Moppeds ca. 4100 Liter. 3850 Liter mit der BMW für 55.000 km und 250 Liter mit den 125ccm Moppeds auf 10.000 km. Wieviel Geh, -Trekkingkilometer ich zu Fuss hinterlegt habe, weiss ich nicht. 30.03.2009 Fred Klein, www.Fredontour.de, schon seit 26.07.2005 - Ende offen ,ein paar Jahre oder mehr auf Weltumrundung. Habe meine Route bisher einhalten koennen, trotz zunahme von laender die nicht geplant waren, in Vietnam, durfte ich meine BMW nicht reinnehmen, habe mir ein fahrrad gekauft und bin 3 monate geradelt, (2000km) dann aus gesundheitsgruenden auf ein gekauftes eigenes 125 Mopped umgestiegen (6000km), das mopped verkauft, das fahrrad auf der bmw QUER HINTEN DRAUF, nach bangkok gebracht,dann in Burma geradelt, aus gesundheitsgruenden, radfahren aufgegeben und eine 100ccm honda gemietet und burma beendet. 12.03.2013 Update and answer erbeten. 24.03.2013 I am afraid that something happened to him because he never answers again. WHO lkows something about him and the last places, addresses, contacts with him. + Nearly Around-The-World. In 15 months Tanja and Christian rode together on one Honda Africa Twin, Type RD04 (1991) nearly 50.000km. Purpose of your travel: See the world. Adventure. Fun in Live. Riding motorbikes. Route: Shipping the bike to New Zealand ((Auckland),121 days / 12.198km) - shipping the bike by boat to Australia ((Sydney) 72 days / 10.852km) - shipping the bike by plane to Kuala/Lumpur in Malaysia (24days / 1.998km) / Thailand (50 days / 4.982km) - Laos (19 days / 1.717km) - Cambodscha (8 days / 1.103km). Shipping the bike by plane to Kathmandu in Nepal 15 days / 998km) - India (38 days / 2.620km) - Pakistan (23 days / 4.620km) - Iran (11 days / 2.520km) - Turkey (53 days / 3.593km) - Greece (9 days / 529km) - Italy - Austria - Germany (6 days / 1.672km). Highlights: Many Experiences. Friendlyness of foreign people. Invitations from foreigners all over our route. See the Himalaya-Range. Book or publication (about your tour): In planning. Useful informations and TIPS for others: Find out by yourself and do it. Earlier Experiences of big Motorcycle-Tours: Turkey 3-month in 2002. Many, many trips to east Europe . 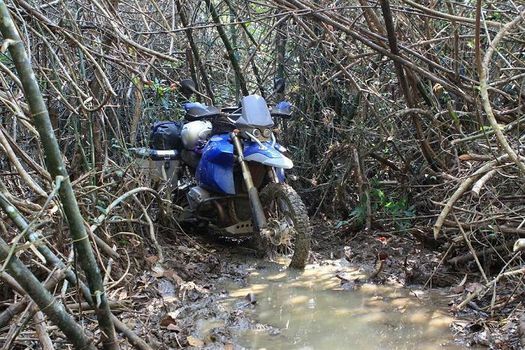 Also a lot of Adventure-Offroadtours with light trailbikes. 07.03.2007 Both are visitors of the Motorcycle Meetings for World-Travellers. + Around-The-World. 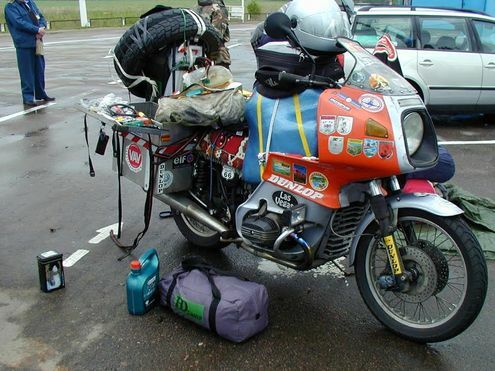 Motorcycle mechanic Matthias rode solo RTW within 5 years 198.680 kms with a Honda Transalp XL600 which he modified to a “Transworld” himself. "My Transworld is the best bike in the World .. she has now 253.000 km totaly with none rebuild .. just a couple of new clutches..". Shipping the bike to New Zealand ((Auckland),121 days / 12.198km) - shipping the bike by boat to Australia ((Sydney) 72 days / 10.852km) - shipping the bike by plane to Kuala/Lumpur in Malaysia (24days / 1.998km) / Thailand (50 days / 4.982km) - Laos (19 days / 1.717km) - Cambodscha (8 days / 1.103km). Shipping the bike by plane to Kathmandu in Nepal 15 days / 998km) - India (38 days / 2.620km) - Pakistan (23 days / 4.620km) - Iran (11 days / 2.520km) - Turkey (53 days / 3.593km) - Greece (9 days / 529km) - Italy - Austria - Germany (6 days / 1.672km). Highlights: In Australia I met an old Su(r)ferfriend on the Airport. The worst: Dead body on the road in Central America. Book or publication (about your tour): in preparation: name globalbiking, ones in a livetime. Useful informations and TIPS for others: recomendation: horizonunlimited.com + wuestenschiff.de + advrider.com - good information about motorcycletravelling !! 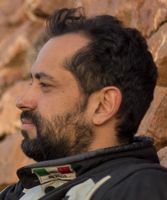 Earlier Experiences of big Motorcycle-Tours: A couple of South-America motorcycle trips in the 1990 `s.
Earlier experiences: After five months I replaced the backpack in Peru with a 600 Yamaha Tenere. In Cusco I met Giselle in 1993, 1994 after 18 months trip I married Giselle. 03.04.2011 First information by RTWorld travellesr Renate Greulach and Gino Grimbacher. 03.04.2011 First request for update. 05.04.2011 First answer with overview out of his website. - Plan Around-The-World. I left home on St.Patricks Day 2006 on a BMW F 650 with my friend Danny Burroughs. When Danny decided to stay in New Zealand in October 2007 I continued riding alone. Route: I spent 9 months in Australia before shipping from Darwin to Dili (Tim or Leste). I then spent 2 months riding through Asia Indonesia , returned to Malaysia and shipped my bike to Chile from Singapore . I arived in South America Chile in December 2008, spent New Year in Buenos Aires and followed the Dakar for the first four days. When the rally turned north I turned south and rode to Ushuaia via the Caraterra Austral. From Ushuaia I followed Ruta 40 to Mendoza then headed east to Uruguay and on to Rio de Janeiro before backtracking to cross Paraguay. After crossing the Andes a few times between Argentina and Chile I entered Bolivia where I broke the Ohlins suspension on my BMW F650 for the second time. Having repeatedly replaced numerous chassis parts I decided the BMW chassis was not capable of continuing on my journey I shipped the bike back to Europe. Useful tips for others: ?? 20.04.2011 Found Adams website by accident. 12.03.2013 3rd request for update. 12.03.2013 4th request for upadate with three best fotos for your blog. 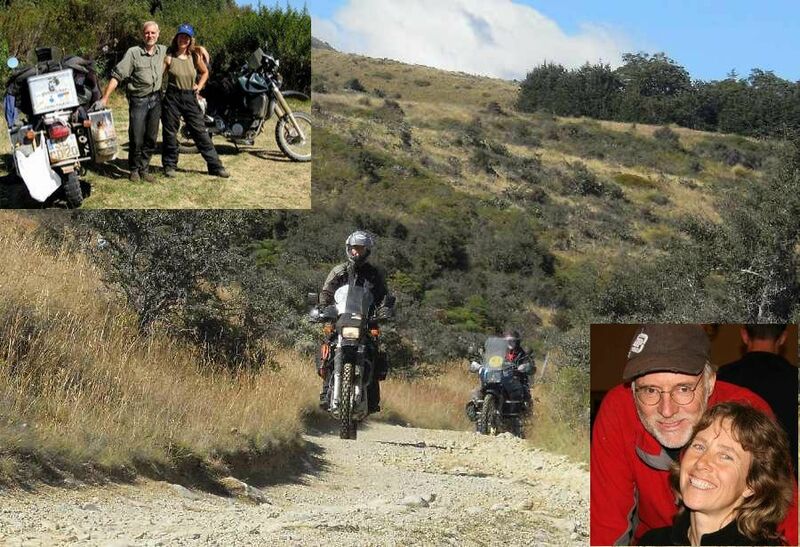 'I left home on St.Patricks Day 2006 with my friend Danny Burroughs.When Danny decided to stay in New Zealand in October 2007 I continued riding alone. I spent 9 months in Australia before shipping from Darwin to Dili ( Tim or Leste). I then spent 2 months riding through Indonesia , returned to Malaysia and shipped my bike to Chile from Singapore . I arived in Chile in December 2008, spent New Year in Buenos Aires and followed the Dakar for the first four days. When the rally turned north I turned south and rode to Ushuaia via the Caraterra Austral. From Ushuaia I followed Ruta 40 to Mendoza then headed east to Uruguay and on to Rio de Janeiro before backtracking to cross Paraguay . After crossing the Andes a few times between Argentina and Chile I entered Bolivia where I broke the Ohlins suspension on my BMW F650 for the second time. Having repeatedly replaced numerous chassis parts I decided the BMW chassis was not capable of continuing on my journey I shipped the bike back to Europe . Doug Wothke. Out of his website. + Around-The-World. 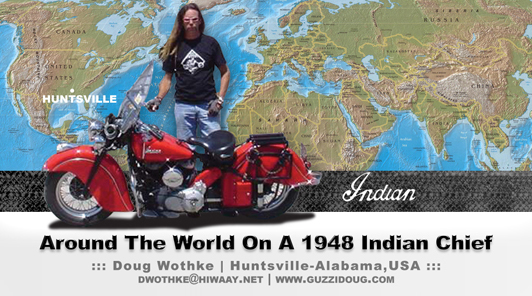 Dough rode solo about 33.000km RTW on a 1948 Indian Chief, which I built by myself from parts. Purpose : no purpose, just to go! Route : North-America ( USA ( alabama ) – Canada ) by ship ?? to Europe ( England - SE thru ?? – all countries in Europe ???? – ukraine – Asia ( russia – by ship ?? to korea ) – by ship to North-America ( USA ( california – alabama ). Highlights : the helpful people that I met along the way. The worst: the russian 'roads' hahaha. Books: no books, just website. Useful informations and TIPS for others : ....?? 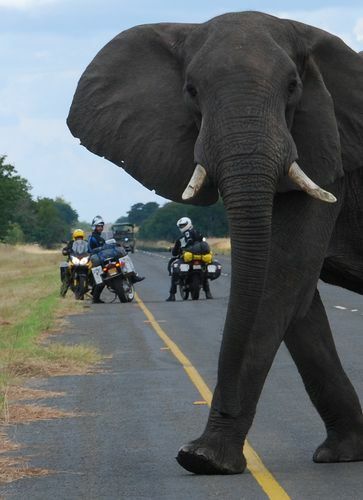 Earlier Experiences of big Motorcycle-Tours :...?? 2006 First info by RTWorld-travellers Renate Greulach and Gino who met him in Russia. 04.04.2011 First summary by Dough. 05.04.2011 First request for update. 08.05.2011 Second request for update. + Around-The-World. Dough rode solo about 45.000km RTW on a 1962 Harley Davidson Panhead chopper, which he built himself from parts. Purpose: No one else had tried it on a chopper. Route: North-America ( USA ( alabama ) – Canada ) by ship ?? to Europe ( Scotland - SE thru ?? – all countries in Europe ???? – ukraine – Asia ( russia – Mongolia – Russia ) by ship ?? to japan – by ship ?? to korea ) - by ship?? By plane ?? to North-America ( USA ( washington– alabama ). Highlights : seeing old friends & making new ones. The worst: the russian roads arent fixed yet ! Books: stories printed in magazines in America & Hungary , maybe soon in Italy & Japan also and the website. No books, just website. 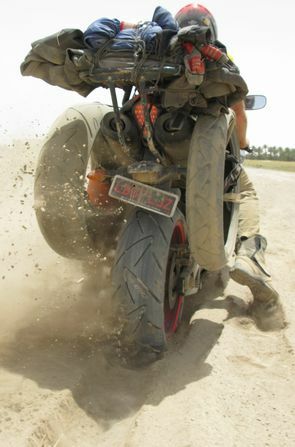 Earlier Experiences of big Motorcycle-Tours : I also travelled europe, usa , north-africa, middle east. Plan: In summer 2011 first harley to magadan (I hope). 2006 First info by RTWorld-travellers Renate Greulach and Gino who met him in Russia . 05.04.2001 First request for update. 16.09.2014 Third request for update and the 2-3 best fotos. On 30 November 2008, JJ returned to the country. Not less than 1000 motorcycles welcome his arrival. Adhiayaksa Dault, Affairs at the time, participate and plans to build a monument Youth in Taman Mini Indonesia Indah. Because of his dedication, he received numerous awards, including the Lifetime Achievement Award from the Association of Motor Indonesia (IMI). The award is the highest award that can be given at the person of Indonesian automotive and until now only 2 people who successfully receive it. After some success with the publication of his first book, about his experiences exploring the world called Wind Rider , next JJ moved on to explore Northern Europe, North Asia, North America, Central America, South America, Australia and back to Indonesia. Unfortunately, when tested, the BMW R1150GS Adventure motorcycle will be used, disappeared from the parking lot in front of his hotel in Amsterdam. World public sympathy over the disaster coming. Dutch society itself enthusiastically support so it does not happen again. After preparing the replacement motor, with brand, type and the same year, at the June 2012 Paris-Jakarta spectacular journey began in Paris 'the city of love' and is expected to arrive in Jakarta in November 2014. Currently Jeffrey Polnaja located in Canada, who explored the country to 77. Book or publication: Wind Rider. Publisher quanita. ISBN 5786028579643. Year ?? 1978: he joined the Aviantara Aero Club, a gliding club and won solo glider flight with dual seater or single seater Schweizer made ​​Corparation, USA. - 1978: first long trip alone, riding motorcycles CB 100 loan. At that time, he crossed the entire island of Java to Bali. 1987, he joined the Army Turangga Horse Riding Club and won trophies in various national championships with a specialization Jump Hurdle (Horse Show Jumping). 1996: he was elected Captain MAT (Marlboro Adventure Team), adventures in America and ranked first. The team consisted of 10 people chosen from 23,000 candidates from all over Indonesia. At that time he and his Indonesian team perform various activities such as adventure, Colorado River Rafting, Off Road Motorcycle and Jeep Off Road in the Manti La Sal National Park, Mountain Biking, Repelling (off the cliff) and Rodeo Games around Monument Valley. 2001: there was an idea to travel around the world dedicated to peace. After discussing with kawan2nya Fahmi Idris, Soeyono (retired Lt. Gen. TNI-AD), Nello Vega and Edi Kuntadi, even this idea, realized. He received rave reviews in various parts of the world, as evidenced by the 72 countries he visited, far exceeding the target of 45 countries are planned. In this way he is often invited to be a guest of honor at various international events, such as: "Adventure Day" at Safsen Resort, Sweden and "BMW Motorad Day" in Garmisch Partenkirchen, Germany attended by 45,000 bikers from 42 countries. Expose it presents visitors got a standing ovation. Appropriate motto "strengthening people to people contact, touching the hearts and minds of the world societies", when this exposure he shared his concern with the spirit of peace and 'global warming', of course, do not miss to promote Indonesia dipentas world. 16.09.2014 First summary of the tour above by B.T. with infos out of his website and facebook-site "Wind-Rider"
16.09.2014 First request to Jeffrey Polnaja for his email. 18.09.2014 First answer by email. 18.09.2014 First request for update and 2-3 best fotos for his blog..
2006. Theo Kelz during his trip around-the-world. Le: ?? in ??. re: ?? in ?? + Around-The-World. 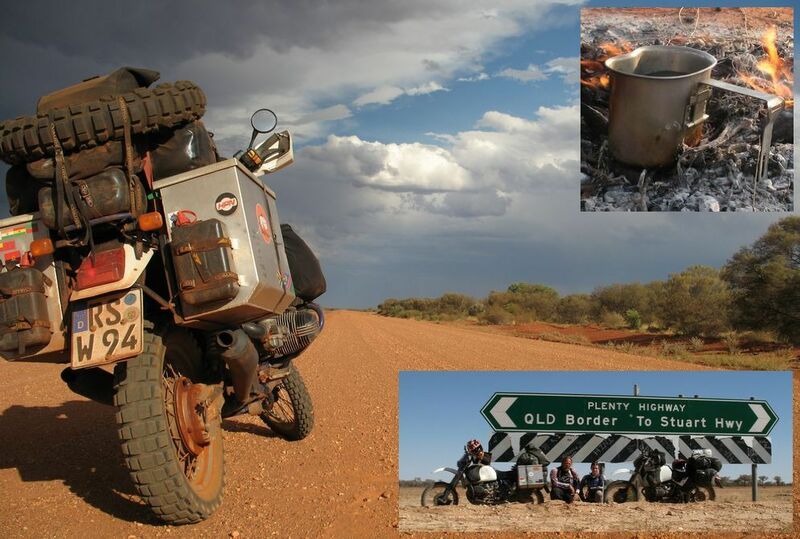 Theo rode solo in 86 days 24.800 km by motorcycle BMW R 100 GS (all 500 kg ! ), 2.000 km with the railway Transsib, 1.500 Km with a ferry form Russia (Wladivostok) to Japan and finally he flew 13.600 km. Planned Route: Europe (Austria - Hungaria - Ukraine - Russia) - Asia (Russia - Siberia- Mongolia - back to Russia form Cita 2.000 km by train, rest to (to Wladivostok) - , quer durch Japan, nach Vancouver in Kanada, über Whitehorse nach nach Dowson Creek über die größten Nationalparks Kanadas Jasper, Lake Lois und Banff nach Calgary, die Olympiastadft aus dem Jahre 1988 über die Provinzen Alberta, Saschkazewan, Manitoba, Ontario, nach Halifax, und Toronto, zurück nach Europa, nach Österreich. Earlier Experiences: Mit meiner Tochter Andrea reiste ich 1994 nonstop mit dem Motorrad von Feldkirchen bis Peking. 2003 fuhr ich mit Biker-Freunden aus Tirol quer durch Südamerika, wobei ich in Bolivien in eine Revolution geriet. Das war drei Jahre nach meiner doppelseitigen Handtransplantation an der Universitätsklinik Innsbruck. Zwischendurch machte ich einige "Aufwärmetouren", unter anderem ans Nordkap, mit meinem Bruder Meinhard und dessen zwei Söhnen. Ich besuchte einen Russischsprachkurs beim Klagenfurter Sprachinstitut. Ilingua in der Waaggasse und meine russisch Lehrerin Ljuba Vit , brachte mir diese schwere Sprache bei. Sie gab sich große Mühe mir diese Sprache einigermaßen verständlich beizubringen. Es war wichtig für mich, dass ich lesen und einigermaßen sprechen konnte. . Mein Motorrad, eine 1000er BMW, Baujahr 1977, wurde mit einen 80 Liter Spezialtank und mit verstärkten Stoßdämpfern hinten ausgerüstet, sowie zwei 40 Liter Alu-Packtaschen. An Gepäck hatte ich mit (, Ersatzteile fürs Motorrad, eine Notration zum Essen. Speck von meinem Freund Silvester. Weiters hatte ich natürlich auch Bekleidung, Waschzeug und Toilettartikel Werkzeug , 1 Paar Ersatzreifen, Ersatzschläuche, ein Zeit , Schlafsack mit Unterlage ..). Ich hatte auch ein Zelt mit, in welchen ich sehr oft übernachtete. Ich schlief aus Sicherheitsgründen aber vorwiegend in Unterkünften (Hotels .(Gastiniza`s .) Nachdem ich alle Vorbereitungen abgeschlossen und sämtliche Genehmigungen und Impfungen (Businessvisum für 3 Monate von Troijka Reisen und Einladungen für die Durchreise ...) eingeholt hatte, ging es am 15. Mai 2006 los. Ich wurde zu Hause in Feldkirchen von einer kleinen Gruppe von Freunden und Bekannten verabschiedet. Es lag eine gewisse Wehmut und Ungewissheit in der Luft. Mein Bruder Meinhardt begleitete mich bis zur österreichisch-ungarische Grenze. Er sagte bei der Verabschiedung: "Bei der deutschen Grenze hol' ich dich wieder ab, das kleine Stück dazwischen musst du alleine fahren." Die nächsten Tage, Wochen und Monate fuhr ich Richtung Osten. Den ersten Abend übernachtete ich in (der Nähe von Budapest ) in einem Motel . Ungarn und die Ukraine war mir schon durch frühere Reisen vertraut. Ebenso die schlechten Straßen. Sie waren Rumpelpisten, auf den man ordentlich durchgeschüttelt wurde. Ich blieb stehen und kontrollierte immer wieder, ob wohl noch alle Schrauben auf ihren Platz waren. Streckenweise gab es bis zu 40 Zentimeter tiefe Schlaglöcher, in denen man landete, wenn man nicht aufpasste. In einigen Stadt- und Ortszentren waren die Straßen teilweise in viel schlechterem Zustand als auf dem Land. Ich hatte Mühe, meine schwere Maschine auf Kurs zu halten, musste aufpassen, dass ich nicht stürzte. Ohne fremde Hilfe hätte ich mein (500 Kilo schweres ) Motorrad nicht aufstellen können. Meine neuen Stoßdämpfer, die ich vor der Abfahrt eingebaut hatte, gaben schließlich den Geist auf. Sie hatten keine Dämpfwirkung mehr und der Rahmen schlug durch, sodass der Reifen platt wurde. Hilfsbereite russische Autofahrer blieben stehen und halfen mir, die Sache zu reparieren. Starke Gewitter, Regengüsse und Hitze waren meine Begleiter, auf den langen, endlosen Straßen durch (Sibirien ) . Am (20) Tag meiner Reise gelangte ich nach Novosibirsk in Westsibirien, der viertgrößten Stadt Russlands. Dort besuchte ich die Lager und die Arbeitsstätten, wo mein Vater fünf Jahre in russischer Kriegsgefangenschaft war. Heute ist (sind) dort noch (.die Baracken und Lager .) zu sehen. Ich dachte an meinen Vater, der vor (..9 Jahren) starb. Er erzählte uns Kindern von seiner Kriegsgefangenschaft (.und was er dort erlebte. Die Arbeitsbedingungen waren sehr hart und viele Kriegsgefangene starben während dieses langen Aufenthaltes in der Gefangenschaft, weil die Lebensbedingungen sehr sehr hart waren. ) Ich dachte mir, als ich an der Stelle stand, (dass mein Vater hier in dieser Weite Sibiriens die schönsten Jahre seines Lebens verbringen musste und er von seiner Jugend überhaupt nichts hatte. ) Novosibirsk ist heute eine aufstrebende Wirtschaftsmetropole. Ich blieb (..3.) Tage in der Stadt und sah mir außerdem (..viele historische Gebäude und Sehenswürdigkeiten an. In dieser Stadt, wo der OB, einer der größten Flüsse Russlands durchfließt ist auch die Oktoberrevolution von Lenin ausgegangen und Lenin ist heute noch der große Held dieser Stadt. Denn viele Denkmäler von Lenin erinnern daran Ich stellte fest, dass es in den Tagen wo ich hier Novosibirsk meinen Aufenthalt hatte sehr warm war. Am 14.06.2006, um 18.00 Uhr, hatte es noch 25 Grad Celsius ) . Von dort ging es am (4. 6.2006 ) über Krasnojarsk weiter nach Irkutsk zum Baikalsee. Die Stadt Irkutsk liegt etwa 5.000 Kilometer von Moskau entfernt. Die Straßen in Sibirien waren katastrophal. Cirka 150 Kilometer vor Cita hatte ich mit dem Motorrad einen Rahmenbruch und einen Reifenplatzer. Ich sah mich schon in der Wildnis übernachten. Da hielt ein Auto, aus dem drei Burschen stiegen, die mir ihre Hilfe anboten. Nach ungefähr zwei Stunden war der Schaden behelfsmäßig behoben und ich konnte die Strecke bis zur nächsten Stadt (Cita) fortsetzen. Dort ließ ich mein Motorrad in einer Werkstätte reparieren. Russische Mechaniker vom dortigen Motorradclub halfen mir dabei. Der Rahmen musste geschweißt werden, weil er unter dem Sitz total durchgerissen war. Die hinteren Stoßdämpfer mussten ebenfalls repariert werden. Da die Russen Meister im improvisieren waren, wurde auch das geschafft. Anschließend stießen wir in einem Lokal auf die gelungene Arbeit an, wir aßen und tranken fast bis in die frühen Morgenstunden. Wodka floss reichlich und es war eine super Stimmung. Ich traf auch Wlad , einen guten Bekannten von meinen Freund Franz Stelzl, welcher diesen vor 3 Jahren kennen gelernt hatte. 50 Kilometer außerhalb von Cita nach (Khabarovsk) war die Straße für schwere Motorräder für die nächsten 1500 Kilometer nicht mehr befahrbar, hier konnte man lediglich mit großen LKW`s oder Traktoren fahren, aber die Strasse ist im Bau und wird in den nächsten 4 Jahren durchgehend auch für Motorräder gut befahrbar sein. So lud ich mein Motorrad in Cita mit Hilfe von mehreren Männern von der Bahngesellschaft auf die Transsibirische Eisenbahn und fuhr 2.000 Kilometer an der chinesischen Grenze und am Amur den Grenzfluss zwischen Russland und China bis nach Khabarovsk. Es war ein großartiges Erlebnis, mit dem Zug durch die sibirische Taiga zu fahren, durch riesige Birken- und Föhrenwälder, die Landschaft während der Fahrt vorbeiziehen zu lassen. Ich erreichte Khabarovsk am 19.06.2006. Dort war ich verwundert, als mich fünf riesige Männer am Bahnhof erwarteten. ich wurde mit einem Hi Theo , you are from Austria, herzlich begrüßt . . ( Die Männer waren vom örtlichen Motorradclub, welcher vom Motorradclub n Cita verständigt wurde , dass der österreichische Motorradfahrer und Weltumrunder Theo mit seinem Motorrad ankommt und sie sollen mir helfen das Motorrad vom Zug bzw. Aus dem Waggon zu heben. Gesagt getan, die Männer warteten auf dem Bahnhof bis mein Zug einfuhr Wir gingen zum Waggon wo mein Motorrad verladen war und in wenigen Minuten war mein Moped abgeladen und das mit purer Manneskraft, den einen Hubstapler gab es nicht. Im Anschluß lud ich die Burschen zum Essen und zum trinken ein, es wurde ein schöner Abend. ) Ich blieb (2) Tage in Khabarovsk und schaute mir (dieStadt und die Umgebung an nd machte auch Ausflüge in die Umgebung.) an. Besonders beeindruckt hatte mich bei meiner Reise durch Sibirien (die unendliche Weite , die riesigen Birken und Föhrenwälder und ich merkte regelrecht, dass die Erde rund ist . Auch stellte ich fest, dass dieses riesige Land entlang meiner Fahrtroute aus riesigen Landwirtschaftlichen Äckern bestand und große landwirtschaftliche Betriebe angesiedelt waren.) Von dort brach ich am (21. Juni 2006) auf und fuhr 800 Kilometer in die im Süden gelegene Stadt Wladivostok. Sie ist Endstation der Transsibirischen Eisenbahn, Russlands größter Pazifikhafen und Hauptstützpunkt der russischen Pazifikflotte. Der Hafen wird mit Eisbrechern ganzjährig offen gehalten. Dort übernachtete ich bei Alexander Schustrik, der ebenfalls begeisterter Motorradfahrer ist. Er wurde vom Motorradclub in Khabarovsk verständigt und hat mich am Stadtrand von Wladivostok sehr herzlich empfangen. Ich konnte vier Tage in seinem Apartment übernachten und so das russische Leben hautnah in der östlichsten Stadt Russlands erleben. Die Hilfsbereitschaft, die Herzlichkeit und die Freundlichkeit der Russen war grenzenlos und großartig. Ich möchte das nicht missen, denn das war für mich eine Erfahrung der ganz besonderen Art. Nach einer ausgiebigen Besichtigungstour von Wladivostok, wo ich viele historische Plätze besichtigen konnte, unter anderem die Endstation der Transib, wie sie liebevoll genannt wird, fuhr ich am (26.6.2006) mit der Fähre "Wladivostok" vom russischen Festland nach Japan. Auf der zweieinhalb Tage dauernden Schiffsreise lernte ich Alexander Ramirez kennen, den Präsidenten der Blue Knights Florida IV, einer Motorradvereinigung, der Polizisten weltweit angehören. Er war auch mit seinem Motorrad auf Weltreise. Wir fuhren gemeinsam eine Woche quer durch Japan, quer durch die Städte Tokio und Osaka - in denen an die 40 Millionen Menschen leben. Die Straßen waren mehrstöckig angelegt, es gab sechs bis acht Fahrspuren sowie Linksverkehr. Ich fuhr in der achten Etage und sah auf die Stadt hinunter. Starker Regen setzte ein und machte die Durchfahrt gefährlich. Da ein Anhalten auf diesen dicht befahrenen Straßen nicht möglich war, war ich komplett durchnässt als ich am Zielort ankam. Der Transport meines Motorrades von Tokio nach Vancouver gestaltete sich schwierig, weil die Transportfirmen keine persönlichen Effekten mehr transportierten. Nur DHL-Global Forwarding konnte ich es danken, dass ich mein Motorrad von Japan nach Kanada bringen konnte. In Japan war alles sehr kompliziert, mein Handy funktionierte nicht mehr, meine Kreditkarten wurden nicht akzeptiert, ich konnte lediglich damit in den Hotels meine Rechnungen bezahlen. Zum Glück hatte ich noch Bargeld (US Dollar) bei mir. Die Japaner waren sehr nett - immer lächeln war die Devise - das Leben dort war sehr teuer. Endlich konnte ich am (14.07.2006.) Japan vom Narita Airport auf dem Luftweg in Richtung Kanada verlassen. Ich flog mit der .Canada Airline nach Vancouver, der Flug dauerte (9) Stunden. In Kanada angekommen, musste ich das Wochenende abwarten, bis ich mein Motorrad aus dem Warehouse am Flughafen holen und die Zollabfertigung erledigen konnte. In der Zwischenzeit lernte ich zwei Tiroler Touristen kennen, die aus dem Zillertal stammten. Wir fuhren gemeinsam zu den Whistler Mountain, in den Stanlypark und andere Orte. Am Montag, dem (.17.07.2006) holte ich mein Motorrad vom Flughafen ab. Die Zollbeamten waren hilfsbereit und freundlich. Sie staunten nicht schlecht, als ich Ihnen von meinen neuen Händen und meiner Weltreise erzählte. Bevor ich meine Reise quer durch Kanada antrat, musste ich noch ein großes Service an meinem Motorrad machen lassen. In den nächsten Tagen ging es den Fraser Canyon in Richtung der Nationalparks Banff und Jasper, wo ich die schönsten Landschaften und die Tierwelt Kanadas kennen lernen durfte. In weiterer Folge ging es hinauf nach Prinz George, nach Withehorse, dann über die Alaska Highway nach Dawson Creek, nach Edmonten und Calgary der Olympiastadt von 1988. Weiter ging es über die unendlichen Weiten der Prärie Albertas, Manitoba. Auf dieser Fahrt, die sehr Abwechslungsreiche Erlebnisse bot, lernte ich sehr viele Leute kennen und konnte so mein Netzwerk rund um die Welt als Weltreisender weiter ausbauen. Ich übernachtete viel in meinem Zelt auf Campingplätzen. In Ontario ging ein fürchterlicher Sturm, der viele Gebiete stromlos machte, weil viele Bäume entwurzelt wurden und auf die Stromleitungen fielen. Die Leute mussten schauen, wie sie ihre Lebensmittel retten konnten, weil fast alle Kühlschränke und Kühltruhen keinen Strom hatten. Weiter ging es bis Ottawa, Montreal und zurück nach Toronto, wo ich meine langjährigen Freunde Hermann Mayer und Ernst Pegutter besuchte - die im Jahre 1951 von Deutschland sowie von Österreich nach Kanada ausgewandert waren. Ich konnte bei Hermann Mayer übernachten, er lebt allein und ist ebenfalls begeisterter Motorradfahrer. Dort lernte ich Kurt aus Colorado kennen, der mich zu sich nach Colorado einlud, damit wir gemeinsam etwas mit den Motorrädern unternehmen können, wie er sagte. Von dort wurde dann auch der Transport des Motorrades von Toronto nach Frankfurt in Deutschland vorbereitet. Mr. Pichup Graham, von DHL-Global Forward Toronto, machte es möglich, dass ich innerhalb von sechs Stunden mein Motorrad flugfertig verpackt und abgefertigt hatte. Er half selbst beim Verzurren und Aufladen mit. Die Kosten für den Transport nach Frankfurt brauche ich erst in Deutschland zu bezahlen. Ich freute mich riesig über diese Botschaft. Nachdem wir dies alles erledigt hatten, fuhren Herrmann Mayer und ich zurück nach Ajax, aber nicht ohne dass wir unterwegs anständig essen gegangen sind. Die letzten Tage in Toronto waren mit Besuchen von Freunden verbunden. Ernst Pegutter hat uns zu sich nach Hause eingeladen, wo wir einen schönen Abend bei Kärntner Musik mit einer steirischen Harmonika verbrachten. Ich freute mich schon auf zu Hause, auf meine Frau und meine Lieben. Mayer brachte mich am Abflugtag zum Flughafen von Toronto. Ich flog mit einer Boing 747 in sechseinhalb Stunden nach Frankfurt. Ich verbrachte den ersten Tag wieder in Europa in einem Hotel, in der Nähe vom Flughafen. Am nächsten Tag holte ich mein Motorrad von der Transportfirma ab, erledigte die Zoll Angelegenheiten und fuhr als erstes zu meiner Schwester nach Schweinfurt, die dort mit ihrer Familie wohnt. Ich wurde dort herzlich empfangen und es gab am Abend gegrilltes Fleisch und etwas zu trinken. Wir feierten bis in die Nachtstunden. Dann kam der Tag, an dem ich die letzte Etappe meiner Weltreise antrat. Nach einer herzlichen Verabschiedung von meiner Schwester ging es von Schweinfurt 650 Kilometer in Richtung Feldkirchen. Die Fahrt verlief ohne Schwierigkeiten. Nach mehreren Stunden erreichte ich endlich die österreichische Staatsgrenze. Als ich die Bundesgrenze überschritt hupte ich sehr laut und sehr oft, weil ich nach 85 Tagen Österreich wieder erreicht hatte. Ich kaufte mir ein AutobahnPickerl und fuhr anschließend zu der Stelle, wo ich mit Bruder Meinhardt vereinbart hatte, dass wir uns trafen. Als ich mein Motorrad abstellte, kam Meinhardt mit seinem Freund angefahren. Wir begrüßten uns so herzlich, wie wir uns seinerzeit an der ungarischen Grenze verabschiedet hatten. Ich sagte zu Meinardt: "Hallo, die kleine Wegstrecke zwischen der ungarischen und der deutschen Staatsgrenze über Russland habe ich bewältigt, jetzt können wir wieder gemeinsam nach Hause fahren." Wir umarmten uns schauten uns lange an und hatten beide Tränen in den Augen. Wir fuhren ohne anzuhalten bis zur Mautstelle durch und dann ging es durch den Katschbergtunnel in Richtung Heimat. Am Millstätter See wurde ich von einer ganzen Motorradarmada, von Freunden und Kollegen abgeholt. Ich wurde von allen sehr herzlichste von meinen Freunden und Kollegen begrüßt. Im Anschluss ging es durch das Gegental in Richtung Feldkirchen. In Ossiach wurde ich von der motorisierten Polizeistreife Feldkirchen, mit der Bemerkung in Empfang genommen, "... damit Du dich die letzten Kilometer bis nach Hause nicht verirrst". Dann ging es über Ossiach nach Feldkirchen, wo ich vom Bürgermeister und der gesamten Stadtregierung der Stadtgemeinde willkommen geheißen und herzlich begrüßt wurde. Das Herz schlug immer schneller und die Sehnsucht endlich nach Hause, zu meiner Frau zu kommen, wurde immer größer und die Spannung stieg. Als ich in meine in meine Gasse einfuhr, erlebte ich eine große Überraschung. Die gesamte Gasse war festlich geschmückt und in der Mitte spannte sich ein Bogen über die ganze Gasse mit der Aufschrift: Herzlich Willkommen. Ich war tief Gerührt über diesen herzlichen Empfang, den mir meine liebe Frau Roswitha bereitet hatte. Es waren viele Freunde gekommen, die mir zu meiner großartigen Weltumrundung und zu dieser gigantischen Leistung gratulierten. Bei dieser Weltumrundung legte ich 24.800 Motorradkilometer zurück, 2.000 Kilometer mit der Transsibirischen Eisenbahn, 1.500 Kilometer mit der Fähre von Wladivostok nach Japan, und 13.600 Flugkilometer. 16.09.2014 First request for the 2-3 best fotos. 2007. Werner Steffens und Claudia Sabel in Australia. - Der Originale "Tesch-Allrad-Becher (er fällt nie um!)" aus Edelstahl zum Trinken und Essen immer dabei (re oben)! 2011: Werner Steffens und Claudia Sabel in S-Amerika. Argentinien. Feuerland. 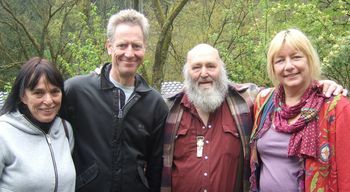 2011-2012: Werner Steffens und Claudia Sabel in S-Amerika. Bolivien Salzsee "Salt de Uyuni". - Küstensand, wo jeder einsinkt (re oben)!. 2013.10.11: Werner Steffens und nun Claudia Steffens zu Besuch bei Patricia und Bernd Tesch in Hammer. In 2002 vor der Welttour waren Sie zu einem Beratungsgespräch schon zu Besuch. - Werner nahm die Alu-Boxen "Tesch-Travel-Taschen". + Around-The-World. Europe- Africa- Australia- NZ- Southamerica- Centralamerica- Europe. Claudia rode with a BMW R80GS and Werner with a BMW R 100 GS from Europe (Germany) across the westcoast of Afrika to Capetown. Around and across Australia and NZ. Zigzag in South and Central Amerika. Purpose of Travel: Live life and ride the world! Route: Europe (Germany- Belgium - France- Spain) - Africa 27.000km (Morocco- Mauretania- Senegal- Gambia- Senegal- Guinea Bissau- Guinea Conakry- Mali- Burkina Faso- Ghana- Togo- Benin- Nigeria- Cameroon- Gabun- Congo- Cabinda- DRCongo- Angola- Namibia- South- Africa). We shipped the bikes from South Afrika (Capetown) to Australia (Perth). After traveling for a while in Australia (38.000Km) and New Zealand (9.000Km) we shipped the bikes to South America (Chile (Valparaiso). South-Amerika (49.000Km) - Chile- Argentina- Bolivia- Brasil- Venezuela- Colombia- Equador- Peru- Paraguay- Uruguay. In April 2013 we went on sailboat trip with the Stahlratte with German crew in the Caribean (Jamaica- Cuba- Mexico- Isla Providencia/Colombia- Panama). We had a good ride with the bikes on Cuba (4.500Km). - Last bit Central America (5.000Km, Panama- Costa Rica- Nicaragua- Honduras- El Salvador- Honduras- Guatemala- Belize- Mexico). - How from America > Germany and countries in Europe ??. The best: Traveling together! Meeting friendly people everywhere in the world. Summer 2002 Recommendation-meeting in Zweifall with B.T. 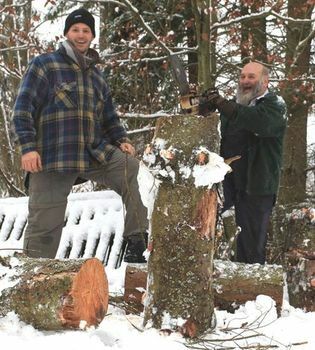 2001-2002 Werner helped us in winter-time to destroy the old wooden cabin on our ground: Thanks !. 09.-10.11.2011 Personal visit of both in Hammer. Felix Bergmeister von seiner website ? - Plan: Solo Around-The-World by motorcycle BMW. 40Länder - 730 Tage - 70.000km . Wien - Kapstadt - Feuerland - Alaska - Asien - Europa. 17.10.2013 Der Mann ist weder per e-mail noch aus seiner website heraus zu erreichen. Laut youtube-Interview 09.04.2012 ist er in 23 Monaten 60.000 km per Motorrad um die Welt gefahren. In Zusammanarbeit mit UNICEF. In youtube gibt es ein kurzes Interview am 09.04.2012. WER weiß wie man den erreicht ?? Purpose of your travel: It has been my dream to ride around the world for a long time and getting so far and seeing so many things also means taking responsibility in a way. There are not that many people who are actually lucky enough to live their dreams and do what they want in life. I think those who are in that position should also share some of their luck, especially to those who would need it the most, such as the children from third world countries. That's why I decided to support UNICEF in order to create a certain level of awareness in western countries and show people how much their help is needed where there is no other help available. After having completed this journey I will act as an UNICEF Spokesman and I will try to involve some individuals and companies to support UNICEF in cooperation with the media. Still to go: South Amerika and Central Amerika: ( Argentina ? Brasil ? Venezuela ?Columbia - boat to Panama ? Costa Rica - Nicaragua ? Honduras ? Guatemala ? Mexico ) - North Amerika : USA up to San Francisco and fly over to Delhi/India - Asia: India ? Pakistan ? Iran ? Turkey ? Greece ? Bulgaria ? Romania ? Hungary ? Austria - Plan to finish around spring 2008. Highlights: Well, going round the world makes you meet a lot of people and let you see many beautiful places. Especially riding through Africa was a marvelous experience to me. To see the change of the landscape all the way from the Sahara to the deep rainforests in equatorial Africa and the Kalahari Desert in Namibia was unmatched so far. For I love landscapes a lot, probably Namibia has got the most scenic one I have ever seen. The worst: Also was n o t that bad in the end. I came to the city of Calabar in the south of Nigeria. Cash machines were not working for there was no power in the whole city. Fuel was not available and you could only get it via the black market. In order to change money I ended up in a garage guarded by private gunmen. The whole scene was looking dangerous. The guy wanted to see all my cash and then he offered me a bad rate. So what to do - lo o se a lot of money or try to become his friend? I went for the second option. After telling him how bad it is that the people of Nigeria have to suffer so much due to having no power and fuel in the city and that no proper steps are taken by the government to help them out, he turned nice. We shook our hands and the gunmen started laughing. Needless to say, I got a good exchange rate as well. I just think it depends so much on how you 'step up' to people. If you show respect you normally get respect back. Book or publication: The German version is already at about page number 150 and then the English version will follow. I try to give people an insight what traveling over long distances is like and of course what steps have to be taken to actually get where you want to be. Like most dreams we have, as long as we don´t get up to follow them they will remain unfulfilled. I will also give a bit of insight focusing on the work of UNICEF in the countries I have visited, especially pointing out how much our support is needed to help the children. Useful / important informations and TIPS for others: It takes a lot of commitment to get on a motorbike, to turn the key and go on the long way round. It might certainly be the experience of somebody ´ s life, but it also means leaving a lot of comfort behind and things like solitude or fear will be there and have to be coped with. When you are ready to face these things, then it is time to go. Just do it. 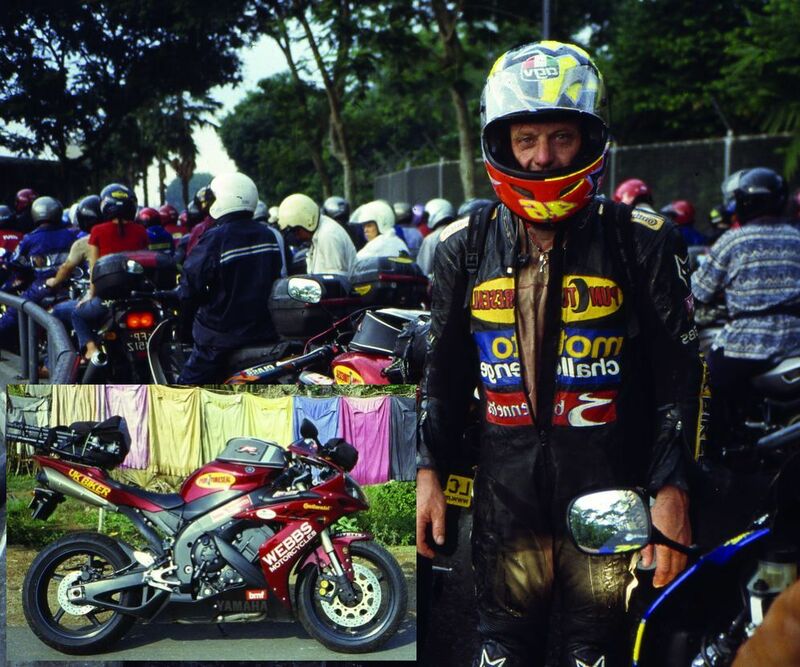 Earlier Experiences of big Motorcycle-Tours: I was an athlete before, doing ultra distance triathlon. So I did up to 20 000 kms on the bicycle a year and figured out that this would take me quite far on the globe. For the love of motorbikes I took my old flat-twin out and yep, here we go! 17.10.2013 3rd request for update this blog above. And send the three best fotos for this blog. And a digi-route if possible. E-mails came back. Even out of his website!!! 17.10.2013 New request to Esther Zierau if she knows him today. + Around-The-World. 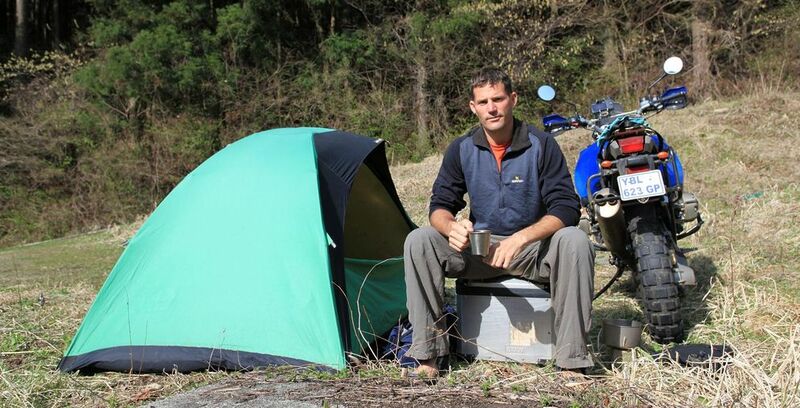 Joachim planned and made it to circle solo the world with a BMW G 650 and KTM 990 Adventure in 2 years ! Seven months Joachim was acompanied by Marisa from Guatemala. She will be his wife in future. Purpose: Travel and do good. Help people, adventure and see different cultures. Route: - North America - Middle America - South America - West Coast of Africa - Europe. Earlier experiences: Transafrica. Thailand. Europe. Info: Deine Alu-Koffer sind Weltklasse ! Haben mehrere Stürze bei Transafrika gut überstanden ! 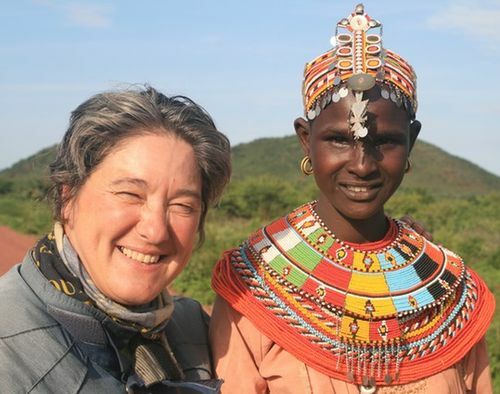 Book about Africa: Atempause, Highlights Verlag, Euskirchen. 22.04.2005 Visitor of 27th. Mc-Meeting for World-Travellers. 01.03.2007 Gave me a call. Wanted possibly come to recommendation. Needs some articles. 27.-29.04.2007 Promise to come to the 29th. Meeting for World-Travellers. 22.05.2008 Next request for Update the blog: Plan Route Alaska (Vancouver- Westküste Kanada- Anchorage- Fairbanks - Prudhoe Bay ) - Westküste USA, Mexico über Baja California, Mittelamerika, Kolumbien bis Feuerland. 28.05.2009 Gruss aus Köln! Ich habe es geschafft nach 25 Monaten. 57 Länder. 111 000 Km weltweit (wie Du damals in Afrika). 17.000 € für Vorträge. Spenden. 01.06.2009 Bernd Tesch called Joachim to say him welcome back in Germany. Request for update this blog. And to send the very best picture. He collected € 17.000 for his projects to help children. 01.06.2009 Last Update. Took possibly picture from his webiste with his permission. - Plan Around-The-World. We plan to travel around the World with our Honda Africa Twin, RD04. About 50.000 kms, from the north of Italy, where we live, to the Northcape in Norwegian. Our first goal. Then we'd like to travel from the Northcape to Australia trough Russia. That's our dream that we'll realize from June 2006 - 2008. Earlier Experiences of big Motorcycle-Tours: We travelled around in Europe, for example in the north of Germany, Toscana (Italy), Croatia, Austria) - and we have some experience and adventures travelling with the tend, travelling around in our little Fiat Panda. Fotos: Dafne und Rob de Jong am Baikalsee in Sibirien. Layout B.T. 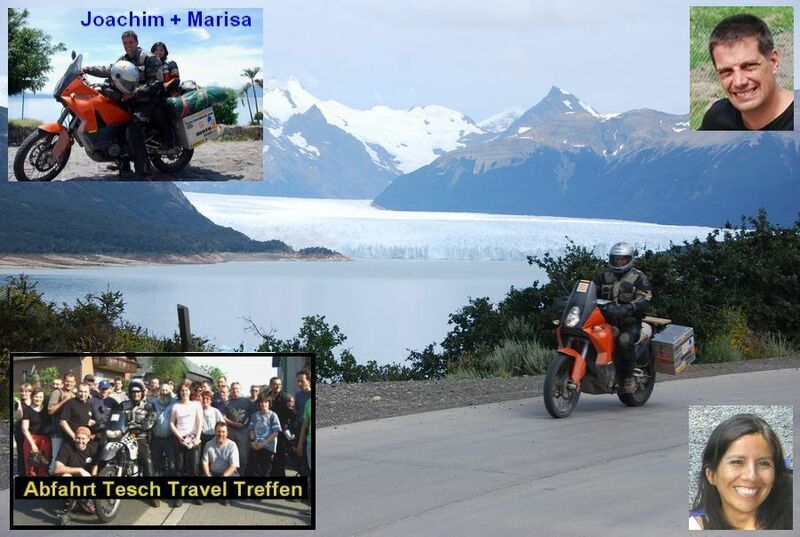 + 11 persons Around-The-World 30.000 km.Dafne and Rob de Jong organised, rode and guided on a YAMAHA TDM900 a group-tour Around-The-World. Both circled the world three times by motorcycle. Price € 15.950. The name of the tour was: The Motorcycle Caravan Around the World. 9 other Participants: Edy Breukers (NL, BMW/GS), Hans Heinsius (NL, Kawa VN800Classic), Jan Mulder (NL, BMW/GS, http://mulderjan.waarbenjij.nu ), Theo Binkhorst (NL, Yam FJR1300), Jan Reuverkamp (NL, BMW/R1100R), Hugo Broers (NL, BMW/F650GS), Michael Müller (D, Yam XT660/PD http://www.myXT.de)), Jaroslav Roubal (CZ, KTM900Adv), Jaroslav Kadlec (CZ, BMW/GS). Purpose: The plan was to circle the world in 80 days. But finally even 105 days was a short time. Everything was tightly scheduled. We rode 30.000 km. Everyone wanted to be back home with their families for Christmas 2007. Route : The bikes were shipped out from Europe (NL, Rotterdam) in a container (seafreight) to America ( (New York in USA ). The group traveled through the USA and Canada (New York, Toronto, Ontario, Minnesota, North Dakota, South Dakota, Nebraska, Wyoming, Utah, Nevada, Arizona, California). The bikes were shipped out by airfreight from USA (San Franzisco) to Australia (Sydney). By bikes NSW, Queensland, Northern Territory and through the red center to South Australia and back to Sydney. The bikes were airfreighted to Asia (Kathmandu in Nepal). Bye bikes to India (Pokhara, Varanassi, Agra, Amritsar) - Pakistan (Lahore - Multan through Baluchistan to Taftan) - Iran (Bam, Shiraz, Esfahan, Hamadan and Orumijah). The winter in Europe had started in Turkey with snow and mist and temperatures below zero. Europe (Turkey - Greek - Bulgaria - Romania - Hungary - Rep. Tchec - Germany - The Netherlands (last night as a group in Dulmen at the Bikersfarm). The best: To get your motorcycle from the airplane, press the start button and hear the engine running again. The worst: Hugo's (73 years) crash in Death Valley, USA (concussion). The group took care of him, but he decided that the third part of the tour (from Kathmandu back home) would be too heavy for him. Book or Publication: We do slide shows for everyone, especially big groups. There is a weblog on our website. Useful informations and TIPS for others: If you do not have more that 50-100 days, join us instead of doing all yourself. Don't let your tour be spoiled by all the red tape; let us do this for you. 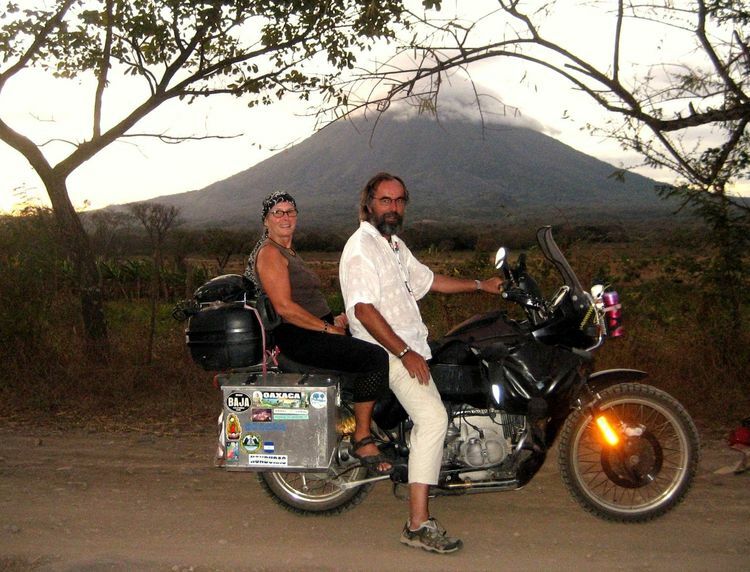 Earlier Experiences of big Motorcycle-Tours: Ride-on WorldTour from 1996-2001: Rob and Dafne rode 2x around the world with a Yam XJ900F with sidecar; IceRide Siberia in Dec 2003 + 3 months: Rob and Dafne with XT600E and XT600E Stern sidecar rode over frozen Lake Baikal; Motorcycle Caravan to Japan in 2005/60 days: Rob and Dafne guided a group through Russia, Central Asia and Siberia to Japan. 22.09.2006 1st summary bye B.T. and 1st request for update. This is the first "Dutch guided tour Around-The-World by motorcycle"
21.06.2009 B.T. The dutch woman "Dafne de Jong" is the world-champion: She is the first woman who rode three times by motorcycle "Around-The-World". Two times by sidecar with her husband. As far as B.T. knows Dafne rode ca. half time the sidecar herself. The third time both rode on one solo bike YAMAHA TDM 900. 21.06.2006 Dafne visited our private sonchangeparty. And we phoned To Rob being in Russia / Vladimir with a group. 26.06.2008 Last Update by Dafne. Fotos: Kathrina Herrmann und Thomas Kröger. Layout B.T. + Around the World. 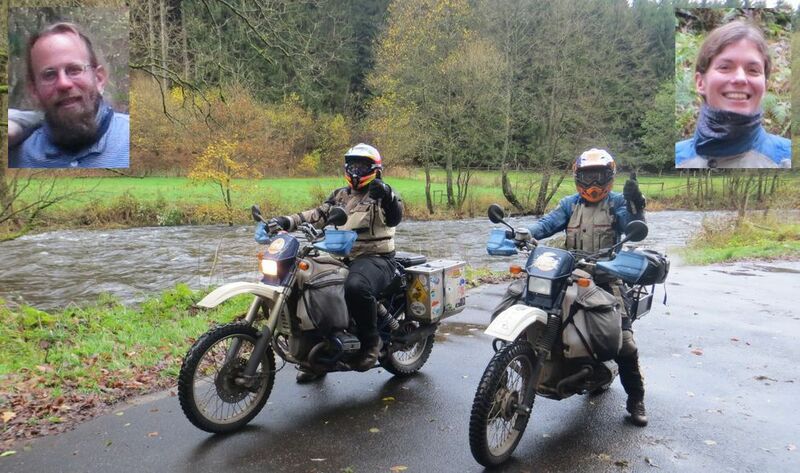 Katharina (Suzuki DRZ 400) is riding together with Thomas (Honda Transalp) "Around the World". Purpose of travel: Curiousity. We wanted to see how different human lives and nature can be and experience ourselves in an unknown environment. Through our project Connecting Kids (3rd price MRT-Reiseförderpreis 2007) we try to encourage kids´ curiousity to other countries and connect them to our school in Germany. www.connectingkids.eu und http://bernstorffgym.de/seiten.php?id=109 . Route: Shipped from Germany (Hamburg) to Argentina (Buenos Aires). Travelled in two years to Alaska and back to California (70.000kms). Shipped from USA (LA) to New Zealand in Dez 2009. Shipped from Christchurch to Australia (Sydney) in April 2010. Rode around Australia (30.000kms). Shipped from Australia to Istanbul (Across the Ocean Shipping, Contact: Tim Hibbard sales@atoshipping.com about 600 AUS$ for 2 motorbikes!). Istanbul port procedure extremely complicated and expensive! Rode back in Europe from Istanbul home to Germany along the wonderful adriatic coast. Will be back on the road asap!! Highlights: Met hundreds of wonderful people, either travellers and locals, who were very hospitable and friendly. Experienced our own limits, learned to stick together even in stressful situations and saw unbelievable amazing landscapes. The worst: Port-burocracy in Buenos Aires (now we know, Istanbul is worse...). Teft in Ecuador in an internet cafe. Somebody tried to violate Katharina in Colombia on a beach.. Useful / important informations and TIPS for others: ....For example: Cheap and very good shipping from LA to NZ, just 500 US$ incl. customs and storage! You are very welcome to ask us for more information, if needed. Robert Stevens imperialfreight@msn.com sends one containerload of vehicles from Los Angeles to NZ (and back) mostly every 3-4 weeks. We payed just 500 US$ incl. customs and storage and very nice contact! You are very welcome to ask us for more information, if needed. 04.2001 Thomas visited first TTTReffen for Mc-World-Travellers. 19.02.2011 New request for update. 09.08.2011 Asked for update. They are back in Germany. 2. Reise vom 22.06.2009 - 08.05.2010: Kolumbien bis Brasilien. + North- and South-America. 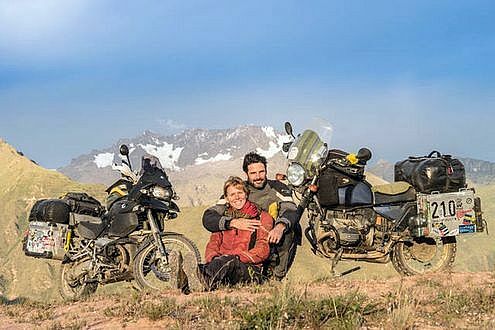 Heidi and Wolfgang rode 73.000 km with one BMW R 100 GS. Purpose: They had a dream in 1972 to circle the world with a BMW R 26 in 1972. But then two own kids came. 35 years later they started finally. 1. Reise vom 30.05.2007 bis 17.04.2008: Kanada - Alaska- Kanada- USA - Mexiko - Belize - Guatemala - El Salvador - Honduras - Nicaragua - Costa Rica - Panama. 2. Reise vom 22.06.2009 bis 08.05.2010: Kolumbien - Ecuador (Flug nach Galapagos) - Peru - Bolivien - Chile/Argentinien - Paraguay - Argentinien - Uruguay - Brasilien. Plan 4. Reise: - Jan. 2014 Weiterfahrt über Indien nach Deutschland . The worst: Auf Gravel kurz vor Ushuaia Reifen geplatzt. Wolfgang Schlüsselbeinbruch, ansonsten nichts passiert. Moto konnte repariert werden und nach 6 Wochen Ausheilung ging es weiter. Earlier experiences: 2006 Rumänien als Testfahrt. Useful tips for others: Nicht zu viele Gedanken vorher machen, man findet immer wieder eine Lösung und Hilfe. Besonders interessant unsere Seite zum Motorrad was speziell die Werkstätten, Wartung, Reifenbeschaffung etc. betrifft. 11.11.2011 Second request for update. And the best foto. 27.03.2012 Third request for update. 13.04.2012 Plan may 2012 Russia: Wir hatten mal eine Moto-Weltumrundung vor, doch wie die politische Situation in manchen Länder aussieht, eher unwahrscheinlich, dass es geht. 11.04.2018 Wolfgang wil ev. zum 60.TTT kommen. 12.04.2018 New request for Update the block above and answer the ??? 2009. Africa. Egypt.- Ri: 2015. South America. Peru. 2015.11.: Africa. Angola.- Ri: 2016.11. South America. Equador. Purpose: Daniel (graphic designer) startet his attempt to travel around the globe on a BMW R80G/S in 2008. He left on a zero dollar budget hoping he would find random jobs along the way to pay for his journey. From Europe he went South, along the northern coast of Africa into the middle east, Iran, Pakistan, India and so on. 2 years into his trip. In Bangkok, he met Josephine a German backpacker. The two hit it off and travelled together for several months until "Joey" had to return for her carrier. Daniel continued to survive on the money he made along the way. Halfway around the world, in New-Zealand, he decided to take a break in order to spend time with Josephine. While Daniel made a film about his journey "Somewhere Else Tomorrow", Joey got her drivers license and bought a motorcycle (BMW R80GS). 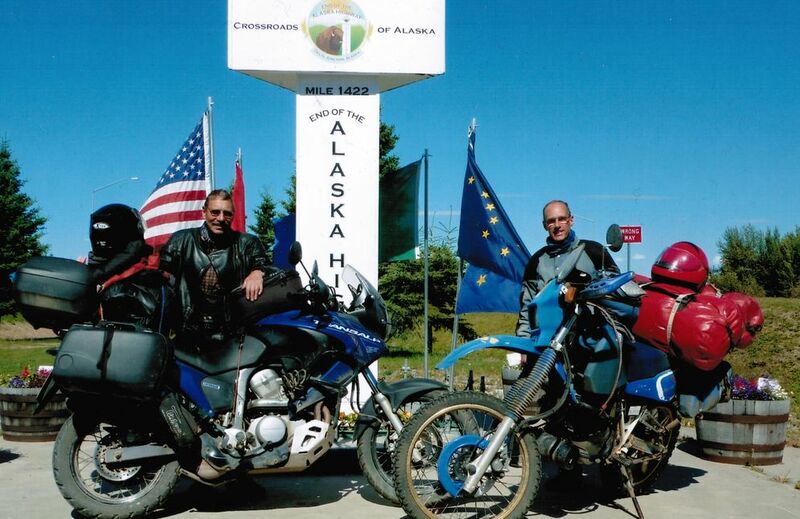 In 2014 both of them started in USA (New York) to ride from the norther-most tip in Alaska all the way down to Argentina. When they reached their goal two years later, they decided to back home through Africa the west coast route. Route: in 2008: Europe (Germany- France- England- France- Spain- Portugal- Spain). In 2009: Africa (Tunisia- Libya- Egypt)- Asia (Jordan- Syria- Turkey-, Iran-, Pakistan-, India-, Nepal). In 2010: Tibet-, China-, Laos- Cambodia- Vietnam- Thailand- Malaysia- Singapore- Indonesia)- Australia - 2011: New Zealand = 60.000km.- From NZ by plane? by ship to NA to which city?? In 2014: North America (USA- Canada- Alaska- USA- Mexico. In 2015: Belize- Guatemala- El Salvador- Honduras- Nicaragua- Costa Rica- Panama)- America South (Colombia- Venezuela- Equador- Peru. In 2016: - Bolivia- Chile- Argentina- Uruguay- Brazil- Flight/Bike Shipping to Africa (South Africa (Cape Town)- Lesotho- Botswana- Zimbabwe- Botswana- Namibia- Angola- DRC- RCongo- Gabon- Cameroon- Nigeria- Togo- Benin- Ghana- Burkina Faso- Mali- Senegal- Gambia- Senegal- Mauritania- Morocco)- Europe (Spain- France- Italy- Switzerland- France- Germany = 100.000km). The best: A new outlook on life, freedom, friends all over the world, breaking down in Pakistan ? Das muss besser kurz erklärt werden! The worst: Breaking down in Pakistan (so I thought) ? Das muss besser kurz erklärt werden! So versteht das keiner. Important useful informations for others: Do as little planning as you can possibly live with, travel as far as you want and not too much further (because of sponsors or other expectations). Don't read guide books, discover everything for yourself, it's worth it. (Jahresdaten! ??.??.19??.??.??.19?? ): Half a year in South America in a Lada Niva. (Jahresdaten! ??.??.19??.??.??.19?? ): Six months cycling around Ireland and UK. .
(Jahresdaten! ??.??.19??.??.??.19?? ): Backpacking throuhg the USA. .
(Jahresdaten! ??.??.19??.??.??.19?? ): Trip down to Morocco in a VW-van. Countless shorter trips around Europe. 28.12.2010 1st request by Bernd Tesch for update with greetings from Adam Shani from Israel ! 21.06.2017 Wrote the sentence above in facebook "After six years..". 25.06.2017 2nd request by Bernd Tesch for update. 10.07.2017 3rd request for update. 14.07.2017 4th request for update. 04.01.2019: 6th and last request for update please. 07.01.2019: Adventure-Film in TV-3-Sat 22:25 Uhr, 90 Minuten: "2-Räder. 1-Welt. 0-Geld." - Plan Around-The-World. 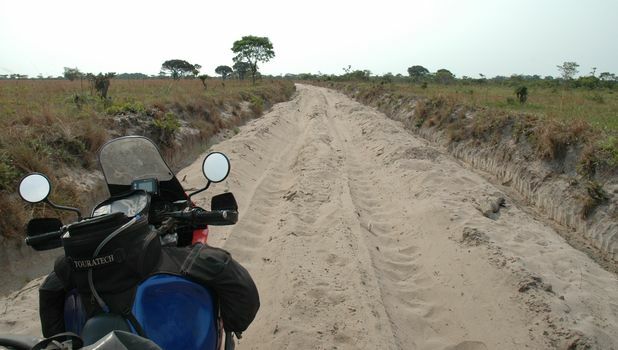 Thierry plans to circle the world in 5 parts.South-America solo with a BMW 650 GS Dakar (2006). End of march 2012: A total Also bis total of 114'000 km.?? 50.000 kms. 04.01.2008 - ? ?.07.2009 First part: in Lateinamerika machte ich ca. 55'000 km. 04.01.2008 - ??.??.20?? Second part: Auf der jetzigen Etappe habe ich bereits weitere 59'000 km zurückgelegt. Purpose: To fullfill his life-dream to circle the world in parts of 1,5-2 years. Then come home to Switzerland and stop for 6 or 12 months to store the impressions, especially to see friends and prepare the motorcycle for the next part. Of course I want to see the nature, cultures, history and human beings "on route". Route: Ich startete am 4. Januar 2008 in Mexico-City und bin während 18 Monaten durch Zentral- und Südamerika (alle Länder ausser Guyana, franz. Guayana und Surinam) getingelt. Im Juli 2009 kam ich wieder nach Hause zurück und machte 1 Jahr Pause. Nun bin ich wieder seit Juli 2010 Richtung Osten, sprich Asien unterwegs. Diese zweite Etappe bringt mich bis auf die Philippinen (Österreich, Ungarn, Rumänien, Bulgarien, Türkei, Syrien, Jordanien, Iran, Pakistan, Indien, Nepal, Thailand, Laos, Kambodscha, Malaysia und Philippinen. Im August 2012 sollte ich wieder nach Hause kommen, um dann im Juli 2013 die dritte Etappe zu starten. Diese wird mich durch Indonesien, Australien, Neuseeland, Südkorea, Japan, Russland, Mongolei, baltische Staaten, Skandinavien und zurück in die Schweiz führen. Die 4. Etappe wird dann Afrika sein (Basel-Kapstadt) und die 5. Etappe Alaska, Kanada, USA zurück nach Mexico-City sein. Europe 12.000 kms (Germany - Austria - Switzerland - Italy - Greek - Turkey ....) - Asia 15.000 kms (Iran - Pakistan - India - Nepal. Bike solo by plane to Singapure. I flew to Singapure. Malaysia - Thailand - back to Singapure). - Australia 16.000 kms (I flew together with bike to Darwin. Around Australia 16.000 kms. Or offer names like: Darwin - Adelaide - Melbourne - Sydney ...) - North-America (I flew with bike to Los Angeles. LA - New York) - Africa - Europe (Bike by ship to Netherlands / Amsterdam - Germany / Cologne). The worst: Schlechtestes und einziges negatives Erlebnis january 2008 until march 2012: ein maskierter und bewaffneter Raubüberfall auf einer einsamen Dschungelstrasse in Guatemala. Book or publication (about your tour):..?? 15.03.2012 First information by "Max und Margit" from Switzerland who travelled with a selfmade UNIMOG and met Thierry in 2007 in Laos..
19.03.2012 First request for a summary like "Müller". 19.03.2012 First summary from Malaysia, Kuala Lumpur: Übrigens Gratulation zu deiner enormen Arbeit. Sehr beeindruckend! Book and map of "Chris" and Alain Arnaud. Re: Alain Arnaud. (C) Foto out ofhis website. (C) Fotos out of there website. "Chris" in Africa- seeing Massai. Re: In USA-California. (C) Fotos all Chris and Alain Arnaud. + Around the World. 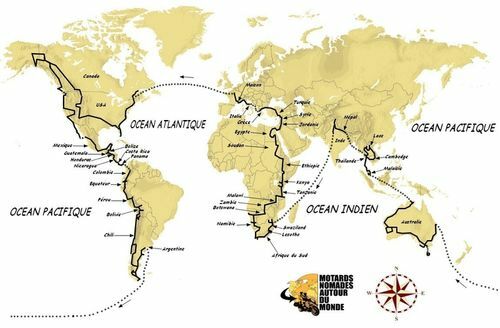 Chris and Alain rode RTW in 2 years 128.305 km on one BMW R 1150 GS across 40 countrys on all continents:1812 heures de moto ! Route: France, Canada, USA, Mexique, Bélize, Guatemala, Honduras, Nicaragua, Costa Rica, Panama, Colombie, Equateur, Pérou, Bolivie, Chili, Argentine, Australie, Malaisie, Thaïlande, Laos, Cambodge, Népal, Inde, Afrique du Sud, Swaziland, Lesotho, Namibie, Botswana, Zambie, Malawi, Tanzanie, Kenya, Ethiopie, Soudan, Egypte, Jordanie, Syrie, Turquie, Grèce, Italie. 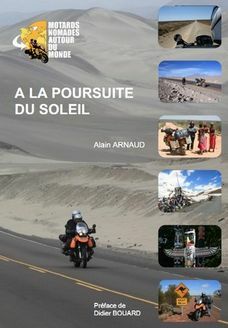 Book: A LA POURSUITE DU SOLEIL (in french € 25,00). ISBN: ?? Useful tips for others: Do the same trip!!! It's fantastic !!! 10.11.2011 1st request for update. 11.11.2011 Request for a portrait of Chris. AND the VERY best foto from the tourr with mc. - Plan Around-The World. 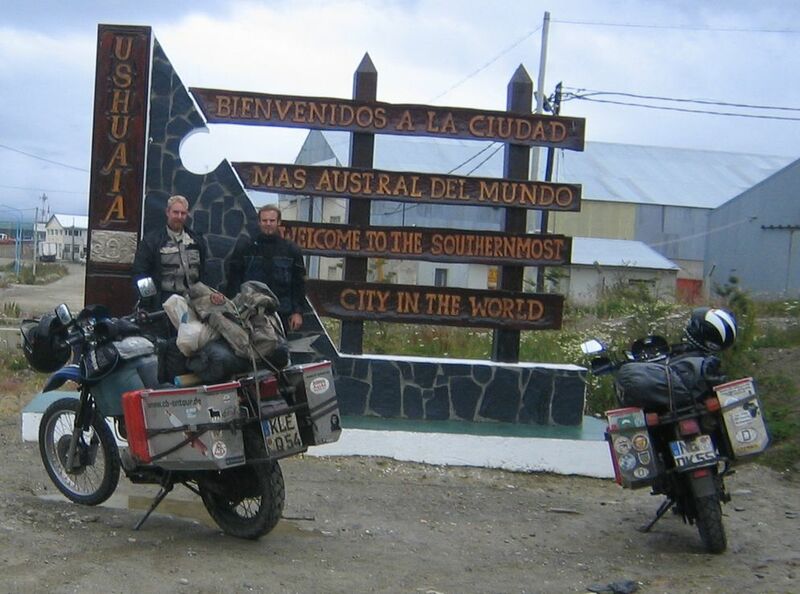 Tony (56.000 miles already) and Martin (10.000 miles already) plan to ride "Around-The-World" on two BMW R 1100 GS. Purpose: Tony: Test myself. I need a challange. Martin: To meet different peole around-the-world. Route: Europe (GB) - Netherlands - Germany - Denmark - Sweden - Norway - south to Rep. Tchechoslowakia - further to Turkey - ASia (Iran - Pakistan - India -Nepal - by plane to Thailand (Bangkok) - Malaysia - ... Singapore) - bike by boat to Australia (person by plane) - about 1 year in Australia - North America - south to .....Panama - South America (Colombia .....Argentina (Usuhaia - Buenos Aires) - no more planned so far. But hopefully Africa with enough of time and money. The best: The plan: Freedom. 26.05.2007 1st personal meeting in Hammer after they found me in BMWfsummary internet with wrong / old address. 22.-23.08.2007 2nd personal visit in Germany buying Tesch-Travel-Tasche and rack. Nick Sanders (C). Solo Around-The-World in 2008. + Around-The World: Parallel World. 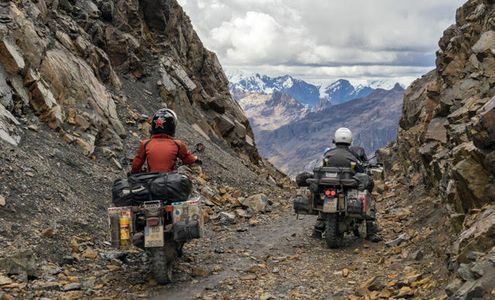 "Parallel World, the toughest motorcycle journey around the world". 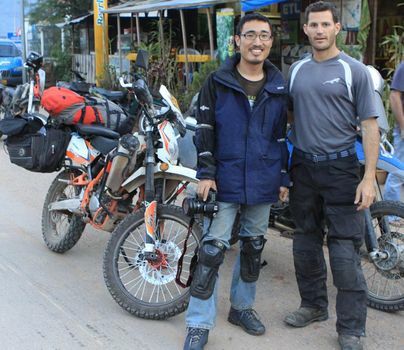 Nick rode 38.000 miles around the world with mc ??-type. ?? : I had this information so far: 55,000 Miles, 45 Countries, 120 Days ! Nick offers this next a guided tour. Purpose of this tour: To ride around the world AND up and down each continent from the southernmost point to the most northerly point. This is the first time such a journey has been done in 5 months. Route: Europe (Across Europe to Turkey, Istanbul) - then down to Asia (Syria, Aqaba, across the Sinai to)- Africa (Egypt, Cairo then down the Nile Valley to Aswan, across the Sudan, Nubian Desert and then overland to South Africa, Cape Town). Fly to Asia (India, Mumbai, ride up to Delhi then down to Hyderabad and Bangalore and Chennai and up to Calcutta. Ride down from Thailand, Bangkok to Singapore and fly to) - Australia (Perth, ride across the Nullarbor, up to Katherine and over to Brisbane and down to Sydney, fly to New Zealand, Christchurch and ride to Auckland). Fly to South America (Argentina, Buenos Aires, down to Ushuaia and then overland to) - North America (Las Vegas and then New York) and Europe (GB, London). The Best: Impossibly beautiful journey. No record but plenty of time to record the project properly and produce a beautifully designed book and film. Met my partner - post divorce, Dr. Caroline. She rode pillion with me from Kenia (Nairobi) to India (Delhi) wearing high heel shoes across Namibia. I don't think any German world motorcyclist has had this pleasure. The Worst: 4 weeks after meeting my new partner, left her for 5 months....:) I came home to early, should have gone up to Prudhoe Bay but simply ran out of time. Important Useful Information for Others: Keep it simple. This was a complicated journey to do in such a short time but by simplifying the planning - obviously based on lots of experience, I achieved a journey which could easily take 10 years. For those riders who do not wish to spend 10 years away from home, this is how to do it. Book or publication: Parallel World, available through www.nicksanders.com. A beautifully produced and well designed book. Took 4 weeks to produce along with a 3 volume DVD set chronicling the journey. Sold 10 000 copies in 2 years. 05.04.2008 1st information personally from Nick (Sanders). Nick now has three children (Willow, Tatty and Juno) and lives in Wales / GB. 30.12.2013 Update with this summary above. 31.12.2013 Next request for update. - Plan Around the World. 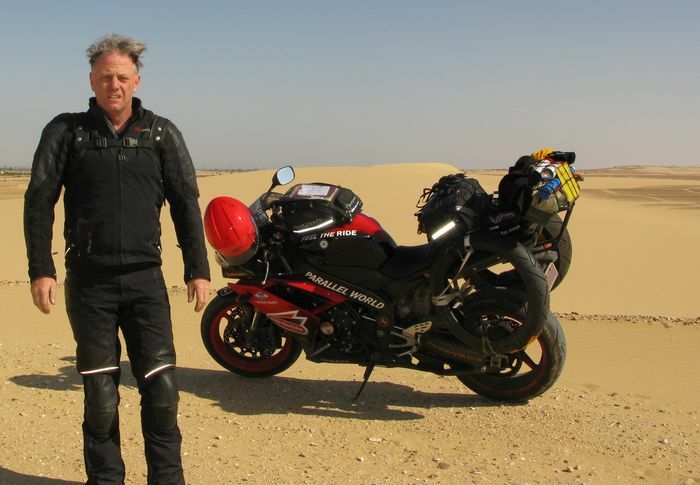 Graham plans to circle solo the world with a BMW R 100 GS/PD. Purpose of your travel: Meeting people, experiencing different cultures, freedom, but best of all riding my bike! Highlights: Discovering what a wonderful world we live in, meeting some great people and making many new friends along the way! They generosity of the Turkish, the warm of the Iranians, the crazy head wobbles in India , the fantastic smiles in Thailand. The worst: Beat up by the Police in Pakistan ! Useful informations and TIPS for others: Just do it! make sure you know your bike! Foto Markus Rummel: Striptease mit Blattverkleidung auf einer früheren Reise. - 2012-2013 in USA mit Tesch-Travel-Taschen. - Plan Around-The-World. 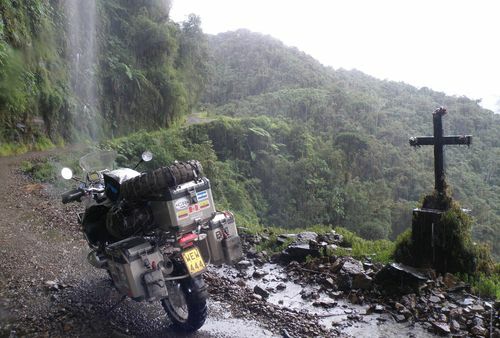 Adi and Markus plan to ride RTW by motorcycle with two BMW F 650 GS Dakar in ? years ! Purpose: Adi: "I was always looking for an adventure and I did not know what it is or could be". In 1993 Adi made a driving licence for motorcycle, only to know if I "can do it". One year later she bought an old Honda CB 450 S and had a lot of fun with short trips near home. Markus: I expext more of life. Markus was inspired by Bernd Teschs book "Afrika Motorrad Reisen" in 1991 at first. In 1993 he bought a BMW R 100 GS Dakar and outfitted this with a rack and alu-box no.2 from B.T. After Adi and Markus saw a slide-show from Klaus Schubert and Claudia Metz in 2003 they decided to travel by bikes themselves. Route: Europe ( Austria - Slowakia - Romania) - Asia (Ukraine, Russia). Further plans are not clear so far. The plan is "no plan". There is no time limit. We start simply. Then we could see what happens, everything is open. We will decide during the journey. Adis earlier experiences: Many travels had been to Greece - by plane as backpackers for Island hopping and family visits, later overland by car and old VW-Campingvan. Other travels had been to Kenia (1990), South Afrika (2000), South Afrika, Simbabwe, Sambia with wildlife-safaris (2001) and Chile (2002). Some were info-travels (employee/travelagent). 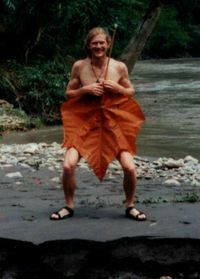 One of the most spectacular travel was Bolivia in March 2002, together with Markus and the group. 1982-2007 Markus rode with 5 different bikes many countries in Europe. 1991 - 2002 Markus travelled with his brother Bernhard Rummel or sister Andrea Rummel or friends as a group each year between 2 and 6 months - as backpackers. 1991: 2 months India (North-South) and Thailand. 1993: 3 weeks in Africa (Seychelles). 1994 / 5: With girlfriend P.S. 6 months South-America. 1996 / 7: 2 months in Central-America. 1998 / 9: South-America with Andrea Rummel. 2000: 2 months with Andrea Mexico. 2001: 2 months with Andrea Asia (Malaysia). 26/ 27.05.2007 Personal visit at Bernd T.
25.-27.04.2008 Participant of the 50th. Tesch-Globetrotter-Meeting in Malmedy / Belgium. 03.04.2019: "Adi" connected me with facebook. Asked for update. Did 200.000 km? - Plan Around-The-World. 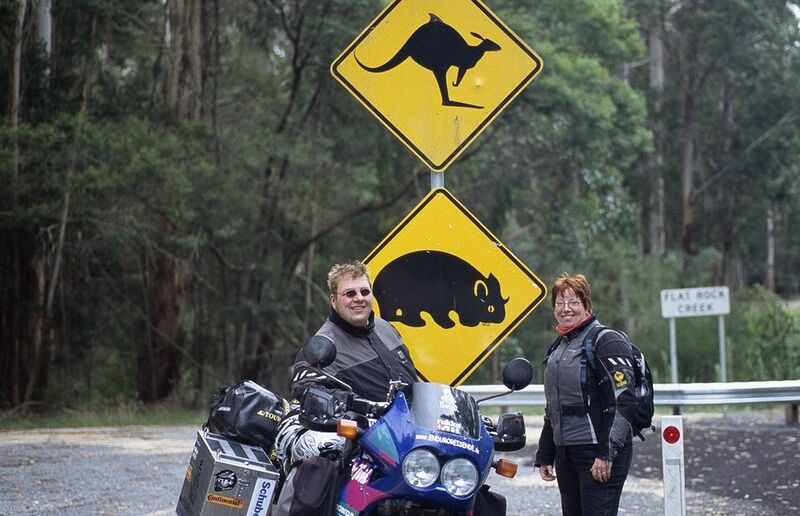 Anita and Markus plan to circle the world on one bike BMW 1200 GS Adventure. The worst: Romania. Many unfriendly people, Too much EU-money for a poor country. Too much rubbish on the street. Ca. 01.02.2010 1st info by Markus by email. 03.02.2010 2nd request for update and the very best picture of both with the bike. "on the road". 07.02.2010 Last Summary. Request for the BEST picture for their blog. - Plan solo Around The World. Purpose: Idea ?? . The professional ?? photographer Oliver plans to circle solo the world with a mc ? within several years. Route: Europe (GB (Cardiff - London - France - Switzerland - Italy (Rom - Pescara) - Baltic sea to Croatia - Bosnia - Serbia - Bulgaria - Turkey) - Asia (Iran - Pakistan - India) - ?. I've not planned any further than that so far and as you can tell my route is pretty rough at the moment but I don't particularly want to over plan things. Earlier experiences: I have done some shorter trips in the past the longest being 3.5k miles around Europe so this is quite the step up from that. >Please take 10 minutes to give a short overview about your plan RTW with a TOURATECH rack and Tesch-Boxes. 12.05.2008 First information about his plan RTWorld: I'm leaving on the 9th of June. I'm planning on a full RTW with Russia , India , Australia , South America and Canada being the key locations. 30th.05.2008 2nd request for update. - Plan RTW in 3 years. 20.03.2009 Found this website in internet somehow. - Plan Around-The-World. The Here to Here World Tour is the dramatic journey of two brothers, traveling eastward for more than 30,000 kilometres on a pair of Buell motorcycles. Along the way, Dylan and C.J. will pass through more than 20 countries and visit places ranging from the dizzying heights of the Rockies and Altai Mountains to the vast expanse of the Gobi Desert and endless forests of Siberia. Starting in Calgary, Alberta, Canada in May 2008, the Tour will take four months to complete and will involve a complete circumnavigation of the globe. 24.05.2008 1st information by Greg Williams, Automotive Columnist, Canada. 25.05.2008 1st request for update. Purpose: We have long dreamed of world travel and are now living that dream. Book: Planned book: Our Story- "1 expedition 2 journeys"
- Solo Around The World ?? Uwe plans a long trip. Possibly solo Around-The-World. Purpose : Ich will mir die Welt anschauen und damit meine Passion für das Reisen und Motorradfahren miteinander verbinden. Wo es mir gefällt versuche ich länger zu bleiben und - wenn es mir nicht gefällt - fahre ich weiter. Im Grunde ist es ein egoistisches Gefühl, welches mich antreibt. Ich hoffe darauf viele freundliche Menschen kennen zu lernen und zu erfahren wie ihr Leben so funktioniert, was sie glücklich macht und was sie traurig werden lässt. Als Motorrad steht eine BMW R100GS PD (1990) zur Verfügung, welche ich teils auf meine Bedürfnisse angepasst habe. Route : Ich habe eine grobe Planung und denke, dass sich vieles unterwegs ergeben wird. Europe ( Polen -Tschechei - Ungarn - Rumänien - Bulgarien -Türkei - Iran - Pakistan - Indien. Indien so lange es möglich ist und es mir gefällt. Dann Asien erfahren. Irgendwann nach Australien und Neuseeland und von dort nach Südamerika. Was kann passieren? Alles kann passieren. Ich habe bei meinen vorherigen Reisen die Erfahrung gemacht, dass einem immer weitergeholfen wird wenn man denkt, dass nichts mehr geht. Natürlich mache ich mir Gedanken über die Gesundheit und mein Leben. Aber wenn ich von diesen Gedanken beherrscht werde, kann ich mich auch ins Bett legen und auf den Tod warten. Das Leben ist ein Risiko und das macht es ja gerade spannend. Von dem Tesch-Treffen erhoffe ich mir Tipps und Anregungen zu meinem anstehenden Trip. Vor allem möchte ich von dem Erfahrungsschatz der Anwesenden profitieren, was das Praktische bei Visabeantragungen unterwegs, Postsendungen aus der Heimat, der Verlängerung des Carnet und mehr betrifft. Around the world on two 70 year old side-car motorcycles, or 'The Dumb Way Around'....:)) (magnificently written travel report!). (See also Oslo->Singapore 2006). 30.11.2005 Adam Shani in ???. HONDA Africa Twin RD 07 with "Tesch-Travel-Träger (steel-rack)" and "Tesch-Travel-Taschen (alu-boxes)". 2003 Adam Shanis HPN-BMW: Parking in Laos.- 2003.03. Adam Shani with ?? Japanese ?? in Laos-Port. 2010. Adam Shani in Japan. 09.12.2010 Second visit of Adam Shani (left) at B.T. in Hammer. Making firewood for the evening outdoor-fire. Ri: 2010.11.30 Les Biano in ??. 30.04.2009 - 01.03.2011 - 06.04.2013 - 14.05.2013 - ? + Around-The-World. 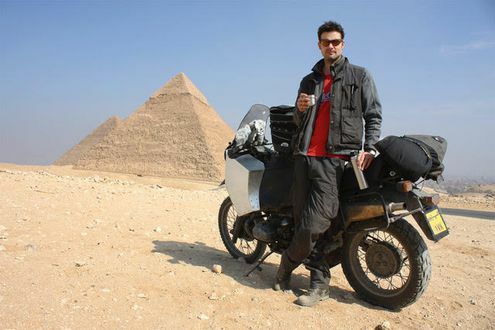 Adam plans to ride solo around the world with a motorcycle BMW F650 Dakar (to buy in S-Africa). But he bought a special bike: BMW HP2 (Build in 2005, under 10.000 km for 7.500 Euro (the new one cost 14,000 Euros. Problems after 80.000 kms so far: Replace of clutch in Switzerland and Kardan in Hungary (Both together: 1800 Euros). Purpose of Travel: To explore new places, meet different kind of people, see the great monuments, and get to know the world I'm living in a bit better. Fun! Africa (South Africa, Namibia, Angola, Zambia, Tanzania, Burundi, Rwanda, Uganda, Kenya, Ethiopia) with plane to Asia (India, Nepal, Burma, Thailand, Laos, Cambodia. Plane to Japan . Ferry to Russia , Mongolia , Kazakhstan , Kirgizstan , Uzbekistan , Turkmenistan , Azerbaijan , Georgia , Turkey). Europe (Greece, East Europe, Chec republic, Germany, France, UK) With a boat to South America (Argentina, Chile, Bolivia, Peru, Ecuador, Colombia) With plane/Boat to Central America (Panama, Costa Rica, Nicaragua, Honduras, Guatemala, Mexico) North America (USA, Canada) With plane/boat to Australia. Route-done so far: Africa (South Africa, Namibia, Angola, Zambia, Tanzania, Kenya, Uganda, Rwanda, Burundi, Kenya, Ethiopia) with plane to Asia (India, Nepal, Thailand, Burma (backpacking), Cambodia. Plane to Japan. Far east Russia > Mongolia >Kazakhstan > Kirgizstan > Tajikistan > Uzbekistan > Azerbaijan > Georgia > Turkey. Europe (Bulgaria > Serbia > Hungary > Austria > Germany >Switzerland). South America (Chile > Argentina > Uruguay > Brazil). Total so far: 36 Countries until 12th.05.2011. 31.08.2010 Greetings from Aktau, Kazakhstan. I'm all burned in the face, after 4 days of crossing the Kyzykul Desert, in North Uzbekistan/West Kazakhstan. A lot of dust, terrible road, and Ruff locals. Needles to say, that I've Loved every moment of it. Camping out in the flat, open desert, with 360 degrees of view, and Arabian Night-sky above… Last Night, covered with dust, and weary from the long road, I set my easy for the first time on the blue waters of the Caspian sea. And what a sight… The bike and I were standing there, looking, almost in disbelief. From Tokyo, Japan, I have ridden north on the highway, and took a ferry to Hokkaido island. This is the northern island out of the main four Island that make Japan, and Nature is very beautiful, and there's a nice frontier feel to the place. From Wakkanai, I took the “Heartland ferry “to Sakhalin island, Russia. The ferry operates from June to October, and cost about 500$ for passenger and bike. 6 hours later we arrive to Korsakov port, and in a few hours the bike was cleared out. There's an English, and German customs declarations, so dealing with customs was not that hard. After 4 days, I took another ferry from Kholmsk, on the West side of the island, to vanino, mainland Russia. From there I have ridden with a group of 4 Russian bikers, and a Japanese MC traveler, along the BAM railroad, and in Amursk, we Turned South, on the Tar road to Khabarovsk. From there I've ridden West, to Birobidzhan, Skovorodino, Chita, and Ulan Ude. 90% of this road is tarred by now, and there are many construction workers on the road. It seems that in 2 years all the road from Vladivostok to Ulan Ude will be 100% tar. In Ulan Ude I've turned south, into Mongolia, and Ulaan Bataar. 1. The South, via the Gobi. Said to be very boring, and a lot of sand. 2. Central, (The one I did) via Karakorum, Tsetreleg, and then Joins the North Road. 3. The North Road, via Moron, Ulaangom,Ulgi, to the Russian border. It was 2200Km from ulaan battar,mostly off road. Mongolia was fascinating country; very interesting nomadic life, friendly locals, and wide, open spaces. I reentered Russia to the Altai Region, and then ridden pass Barnaul, and Pavlodar, into Kazakhstan. Took the tar road South to Almaty, which is about 1000Km, and takes 3 days. From Almaty I was heading South to Bishkek, Kirgizstan, and from there to Osh, and Sary Tash, and the border with Tajikistan. The Pamir highway is a must, and one of the most beautiful roads I have ever seen. It's 4000Meters high most of the time (! ), and the locals are very nice. Food is basic, and it's best to camp out. Roads in the Pamir are quit bad, with many bridges washed away, and waist knee deep river crossings. From Khorog, I've ridden to Dushanbe, and then across the border to Samarkand. Then, Bukhara, and North west across the Kyzykul desert into Kazakhstan again, and west on a very bad road to Aktau. This morning I've bouth a ferry ticket to Baku, at about 250$ for the bike and myself. So tomorrow I hope to leave Central Asia behind, and enter the caucuses. From Azerbaijan I'm planning to travel to Georgia, Turkey, and then somehow in east Europe till west Europe. If all goes well, I hope to be in Germany at the end of September, and to ship the bike to south America at the end of October. That's my news for now, and I hope this little information is helpful for other travelers. I'll email you once I'm in Europe, and I really hope you will be home and have time to meet me. 1999: A tour from America to Mexico and back on a KTM 620 EGS (1996). 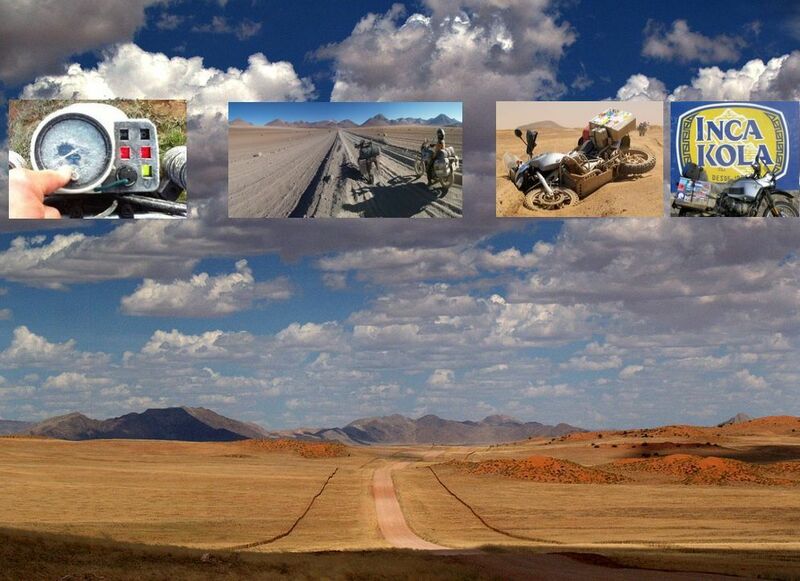 2002\3: Namibia - Botswana - South Africa on BMW R1150GS. 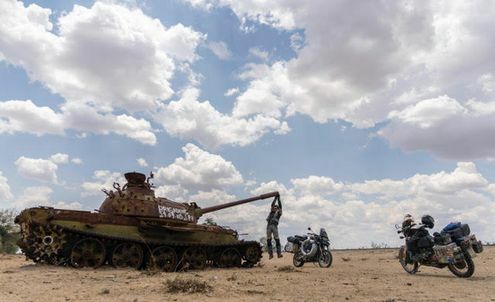 2005-6 Trans Africa . From Cape town to Nord Cap. 2010 Possibly visiting Patricia and Bernd Tesch again.. It will be wonderful to see you, Patricia, and the Oak tree again! 3. Cost of Clutch and Kardan was 1800 Euros. The Kardan was replaced in Humgary, and the clutch was replaced In Switzerland. The bike needed a service and tire repair, the notebook had to be repaired as well, and I had some sight to see. Unfortunately, I did not meet the Bremen family. Javier tried to arrange a meeting, but they were all busy, and then, Javier even tried to go and photograph them separately, but again, they were busy. Javier is aware that the 3 photos are important to you Bernd, and I'm sure he will try and get them for you. It was a very nice 10 day ride from BA to Sao Paulo, via Uruguay. Now, I'm visiting a friend here, and in a few days will ride to Rio, then to the Capital Brasilia. From there, I plan to ride South to Iguassu falls, then into Paraguay, Bolivia, and Peru, arriving to Lima by June, or so. The Bike was shipped from Hamburg to Valparaiso, Chile, with “In Time Shipping”. The reason I choose Valparaiso was for the cheap price, and efficiency. One can clear the bike by himself very easily there, something that is not possible in BA, and cost 1000$ (Yes), unless the bike arrives in a RoRoship, and is categorize as “Personal luggage”. Chile: Valparaiso > Santiago De Chile > Puerto Montt. 1300Km, All good Tar roads. Puerto Montt (The beginning of the Carretera Austral) > Chaiten (By ferry*1) > Coihaique > Lake General Carrera >Chile Chico. 800Km, mix of good gravel, and little Tar. Beautiful Nature, and remote . A lot of rain. Uruguay: Fray Bentos > Mercedes > Florencio Sanchez > Ismael Cortinas > San Jose De Mayo > Montevideo. (320Km, Tar) > Florida > Durazno > Tacuarembo > Rivera. Uruguay/Brazil Border. (500Km, Tar). 1. Shipping- coming from Europe- the easiest and cheapest way at the moment is to ship by sea to Valparaiso. 2. Border crossings- All very easy so far, no need for visa, or carnet. 3. Gear- Patagonia is cold, so warm clothes are needed, and Carretera Austral is very wet- so a good rain gear is a must for this section. 4. Tires- a good on/off road is best for this part. After leaving Argentina, I've traveled into Uruguay- very nice and quiet, with a lot of farmland and places for free camping. Entering Brazil was funny; I stopped in the border town of Rivera, and asked “where is the Border with Brazil”, since there was no clear indication of the border. “You're IN Brazil!” a friendly local told me smiling. There's no official border… OK, I just ridden in, and found myself in one of the most fascinating countries I've ever seen. Brazil is the fifth largest country in the word by size, and the world 8th largest economy… The mix of Indians, Africans, Europeans, and Asians is unique. All seem to get along very well with each other, without consideration of color of the skin. “We are all Brazilians” one person told me…. After Traveling to Rio, and then inland to Brasilia the Capital, I've turned South East, and ridden to Fuz Du Iguaçu. The Iguacu falls are truly amazing! From here I plan to cross into Paraguay, ride to the Capital, and the head North West to Bolivia, via the Trans Chaco. Hope to be in Santa Cruz De la Sierra in about a week from today. Thank you for the invitation for the 55th Tesch meeting! Unfortunately. I’m half way around the world at the moment- still working in Australia: So I will not be able to make it to this year’s meeting. 14.05.2013 From Adam Shani in Australia, Oodnadatta, outback Australia. 11.04.2016 Adam send this: Lets update from Oodnadatta, Australia, which was the last stop in the RTW tour. From "Oodna", I've travelled to Perth, WA Via Coober Pedy, and the Nullarbor headway, and shipped the bike back to South Africa where it sleeps today, with almost 200,000 Km on it. 14.05.2013 End of reports of Adam Shani so far. 18.03.2014 Asked Adam to continue th overview! 26.02.2016 Adam wrote me that he finished his engineering course in Israel after 2,5 years. And is responsible now for the e11quipment of an Israle-firm building roads in Columbia! 26.02.2016 Asked Adam to continue th overview RTW until the end! - Plan Around the world. Mick (Motorcycle Traveller/ Mechanic/ Webmaster/ Photographer/ Waiter. Aircraft Technician) plans to circle solo by motorcycle with a HONDA VFR around the world. 04.09.2011 First information by Swiss mc-trvaeller Danile Schaller who met him in Africa. 16.09.2011 First request to Mick to send a short overview like example Müller and the very best foto with th bike on the road. 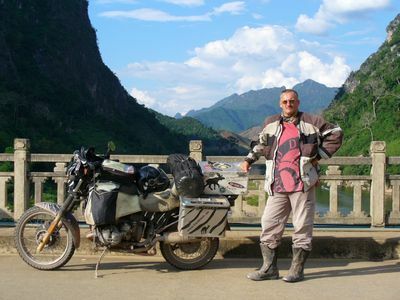 2009: Paul Sterckx after coming up the Karakorum Highway at the border of China. Ri: I met the old lady in Brazil, in the Amazon forest. 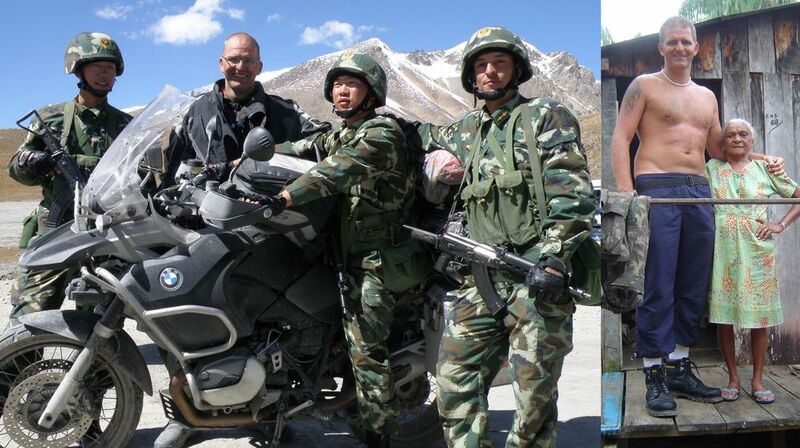 2009: Paul Sterckx after coming up the Karakorum Highway Pakistan - border China. 2009. Paul Sterckx in South America. Bolivia. Dead Road. Ri: Salar de Uyuni. + Plan Around the world. Lorry-driver Paul rode in 9 months solo Around the World 46.000 kms through 4 continents and 34 countries with motorcycle BMW GS 1200 Adventure. Meaning of the trip: Discover other cultures and to find myself . Highlights: Karakoram Highway: Bad road and high mountains. Laos: wonderful landscapes and friendly people. Peru: Inca culture. Brazil: Rio de Janeiro and Foz do Iguaçu. Worst: India: traffic, people show no respect for your property. Police Pakistan: From border Iran to Lahore 1700km followed py the police. Bolivia: Horrable roads after Sucre until border Paraguay. 08.04.2011 Next request for update. Please overwork your blog and send the best foto of you and the bike for this blog and a star-portait. 25.03.2012 Third request for update with fotos. 11.04.2012 Last summary plus fotos. - Plan Around The world ?? Purpose of the your tour? : ??? Route: Unten ist nur ein Beispiel. Bitte schreibe Deine Route bisher. Und Deinen Lände-Plan..
12.11.2009 Marko gebeten seinen Planblock zu schreiben. "Zainab" and "Domi" Dominikus Hocher with VW-Käfer "Herbie" on a tour RTW. Foto (C) Dominikus Hocher. Zainab Staubmann (born 1986 in Vienna, Austria) and "Domi" Dominikus Hocher (born 1983 in Vienna, Austria) http://herbiesworldtour.com With 34 Horses Around The Globe. - Plan Around The world. Zainab and Herbie plan to circle the world in a beetle Volkswagen Bug from 1963 and 34 horses (1,200 cc). A "VW-Käfer (34 HP) with a camper (Qek)" in tow called "Herbie". 28.02.2012: We have travelled through 49 nations on five continents (including all 48 continental states of the USA). We’ve already driven more than 78,000 miles (126.000 kilometers) in our beloved "Herbie" so far and our trip"Around The World" is not even over yet. See “What’s Next“! Purpose: Explore the world as long as it exists! And finding a place where we want to move. Route: Austria, Hungary, Romania, Bulgaria, Turkey, Syria, Jordan, Saudi Arabia, the United Arab Emirates (UAE), Oman, Iran, Pakistan, India, Malaysia, Thailand, Loas, Cambodia, Vietnam, Australia, the United States of America (USA), Canada, Mexico, Guatemala, El Salvador, Honduras, Nicaragua, Costa Rica, Panama, Belize, Germany, the Czech Republic, Poland, Lithuania, Latvia, Estonia, Finland, Sweden, Norway, Denmark, the Netherlands, Belgium, France, the United Kingdom (UK), Spain, Portugal, Monaco, Italy, Switzerland and Colombia (01.03.2012). The best: We found already the place where we're planning to move - the Southwest of the United States. The worst: India - it was for sure a wonderful land in the past, but got obviously ruined by its overpopulation. Important useful informations for others: "We hope nothing. We fear nothing. We are free." Book or publication (about your tour) We'll publish our first book about Herbie's World Tour in 2013, when Herbie get 50 years old. 28.02.2012: "We are on the road since September 2009 traveling through 49 nations on five continents (including all 48 continental states of the USA). We’ve already driven more than 78,000 miles (126.000 kilometers) in our beloved "Herbie" so far and our trip"Around The World" is not even over yet. See “What’s Next“! 28.02.2012 1 request for update. 2010 Dom Giles in Africa. Smaller foto: At Artic Circle. 2010 Dom Giles in ??. Smaller foto in Africa. 2010 Dom Giles map. And in Africa. + Partly Around The World. 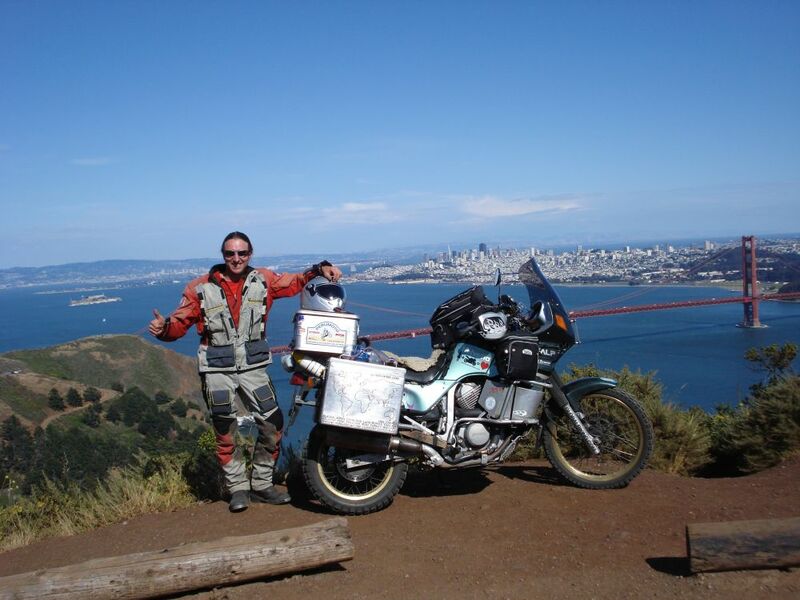 Dom (BMW R 1200 GS) rode solo in North America Alaska to Panama (34,000 kms) and in Africa Cape Town to Nairobi (14,500 miles). Purposel: T see the world, and try to understand my place in it. As well as riding a bike I stopped off and did some voluntary work along the way. In Mexico I worked on a turtle rescue project for two weeks and in Costa Rica at a Sloth Sanctuary for three weeks. In Cape Town I taught for three weeks in a Primary school in a township. In North America my wife, Tracy, came out for three weeks and also joined me for two months in Central America. I returned to the UK for February and in March 2011 I flew to South Africa. Botswana- Zimbabwe- Mozambique- Malawi- Tanzania- Kenya (Nairobi). Four months and 9,000 miles. Highlights: Every day! Space in Alaska and BC Canada. Volunteeering projects I worked on. Namibia! The worst: Mechanical failures which were expensive. Red tape at some Central American borders. Book or publication: "Gone Riding" - Motorcycling and Voluntering across two continents. Our 23rd November 2013. Useful informations and TIPS for others: The world is friendly and people are helpful. Explore, don't rush. Earlier Experiences of big Motorcycle-Tours: 1995:Three months in Patagonia on a Honda Transalp. 1996: One month in Uruguay, Brazil, Paraguay and Argentina. 05.10.2013 First info about the trip and the book by Sam Manicom. 09.10.2013 Next request for update. I’m publishing with Indepenpress and we have a date! - Plan Around The world. Juan plans to circle the world with a HONDA GOLDWING GL 1800. At least so far he has an excellent looking website. From Valencia Spain send you a hug, I have been visiting your website and give me very envious to see everything you've done, I wish I could meet you someday and learn a lot about you and your experience with this type of adventure. Right now I am finalizing details to circle the world in a Honda Goldwing GL 1800. 26.03.2012 2nd request for update. - Plan Around-The-World. Thomas plans to circle the world through all continents within ca. 3 years with app. 100.000 kms. Purpose of your travel: Ich möchte einen Überblick über die Welt und die Menschen, die auf ihr leben, gewinnen, um sie und mich besser verstehen zu können. Da ich ein austauschbedürftiger Mensch bin, würde ich diese Reise gerne zu zweit unternehmen. In meinem Freundeskreis will niemand eine derart lange Auszeit nehmen. Deshalb suche ich einen PartnerIn. Route: Europa - Russland - Zentralasien - Südasien - Südostasien - Australien (ev. Neuseeland) - Südostasien - Nordamerika - Mittelamerika - Südamerika - südliches Afrika - nördliches Afrika - Europa. Highlights: Finden sich sicher abseits der Touristenpfade und der Hauptstrassen - ich möchte sowohl 10 Mio-Städte als auch die Einsamkeit der Wüste, sowohl die Hitze als auch die Kälte erleben. Höhepunkte können genossen und Tiefpunkte müssen überstanden werden. Ich suche aber nicht den Nervenkitzel von Gefahren. My useful informations and TIPS for others: Tips kann ich leider noch keine geben - eher umgekehrt. My earlier experiences of big Motorcycle-Tours: nebst ein paar mehrwöchigen Reisen in Europa eine 7-monatige Tour durch fast ganz Europa 2003. Kontakte: via Bernd Tesch möglich. Emails gebe ich aus Datenschutzgründen hier nie bekannt. 26.03.2012 Um Update und Fotos gebeten. 2011 ca. Dave Harrold in ??. Foto Dave (C). Layout B.T. + Around the World. Solo Around the World with Kawasaki KLR. 64,000 kms. 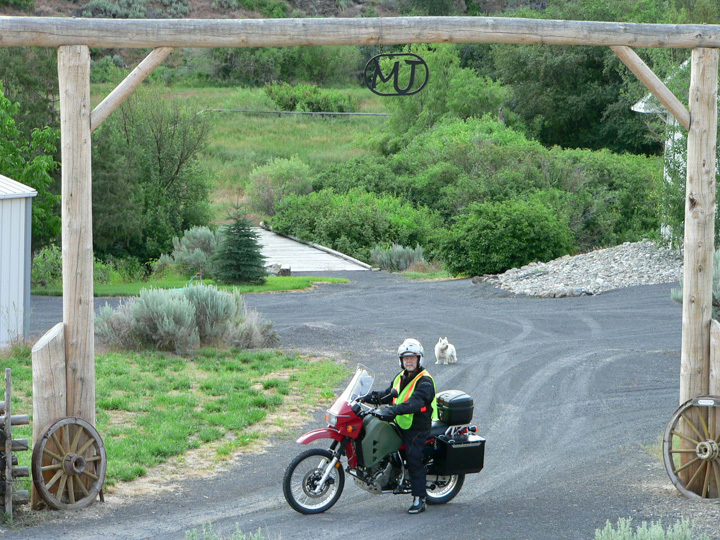 Dave started the trip with a group of riders from around the world: Argentina, Chile, England, United States, and Canada but ended up with one other rider, who also rode a KLR. Route: North America (Dallas, TX to Oakland, California. Then shipped the bikes via Pazific to Asia (Seoul, South Korea. Took the ferry from South Korea to Zarubino in Russia. Traveled across Siberia, down through Mongolia, and back up to Siberia. They wouldn’t let me in Kazakhstan, so I traveled up through Moscow and St. Petersburg. Left Russia to go into Europe (Estonia. They wouldn’t let us in Belarus. That was the fourth country I haven’t been allowed in. The two others were in Central America and South America. Traveled through Latvia, Lithuania, the Ukraine, Poland, Belgium, Germany and on to Netherlands (Amsterdam)) - I shipped the bike to North America (New York and rode from New York to Dallas). The worst: They don’t have toilets in many places in Siberia, just two boards and a hole in the ground. 1. Kazakhstan: I'm not sure why. It may have been the guy I was traveling with. They questioned him at the border for an hour, then questioned me for a few minutes. Finally, they just sent us both back to Russia. 2. Belarus: Their president doesn't like Americans. I don't think it had anything to do with me personally. 3. El Salvador: All of my paperwork didn't jive. The serial numbers on the title didn't match the numbers on the bike. 4. Guatemala: They didn't say why, but we beat the computer. We crossed the mountains, picked up another road and entered from another crossing. The computers hadn't registered our rejection yet. Important useful informations for others: Make sure you have all your paperwork absolutely right in Russia. The Russians are crazy for paperwork. Make sure your bike serial numbers match all your paperwork. "Rock Pounder--adventure rider extraordinaire--is planning a round-the-world trip on his motorcycle. His goal is Amsterdam and the herbal refreshment that awaits him there. But when you're a legend--among women, adventure riders, and spies--nothing is ever as simple as it seems. Come along for the ride as Rock and his bike travel onward through Siberia, Mongolia, and Europe. His destination is Amsterdam and the pleasures that lie in store. The journey will take him places he never expected to go. But when Rock Pounder is on a mission, no one stands in his way, except, maybe, a tall blonde who means nothing but trouble." 14.04.2013 First request for update. 2011 Oscar Ayala Meza in ?? solo with BMW R 800 GS. 2012. Oscar Ayala Meza with his kms until march 2012 in Portugal. His facebook name is Oscar Papayaco. - Plan Around-The-World. Oscar plans to circle solo the world in two years with a BMW R 800 (build in year ??) GS through 4 continents. Purpose: The world on two wheels is the great adventure of crossing four continents in two years, estimated time to return the same starting point in order to demonstrate that when someone proposes a goal, so is the more difficult can achieve more impossible as it may seem. The trip born in the mind of the adventurer Oscar Ayala Meza, he visited on his vacations, different countries and the question became why not make a trip around the world? Moreover, acquaintances remote sites, cities, towns and hiking not imagined reserved only for the few. So I decided to start the travel ride a german motorcycle equipaded systems navigation, panniers, maps, tools, equipment travel and spare parts. This will be the only thing that I’ll bring with me to explore the confines of the planet in this great adventure around the globe and thus becoming the first mexican around the world on motorcycle lonely. Route: North America (Mexico, Belize, Guatemala, El Salvador, Honduras, Nicaragua, Costa Rica, Panama) - by sailboat ship to South America (Colombia, Venezuela, Brasil, Uruguay, Argentina, Chile, Bolivia, Peru, Ecuador) - by ship (1 month 15 days travel) only my bike ( me by plane) to Europe (England, Belgium, Luxembourg, Germany, Netherlands, France, Spain) - Africa (Morocco) - by ship (fast catamaran) to Europe (Portugal, Spain, France, Switzerland,Germany, Austria, Czech Republic, Poland, Slovakia, Hungary, Croatia, Slovenia italy, by ferry boat to Greece, Bulgaria, Romania, Turkey) - by plane to Asia (Malaysia, Thailand) by ship boat to North America (Canada, U.S.A., Mexico). The best: the people around the world, more than landscapes or culture, the people always want to help me, is a dream of everybody (travel around the world in bike). The worst: Nothing everything is good. Bad or good experience is always good because I learn more about all situation in the trip. Important useful information for others: ..Feel free to contact me on Facebook! Book or publication (about your tour): (Website will follow soon): Nothing yet just my website, and some publication in a mexican and colombian moto magazine. le > re: Nina Tin-Rasmussen. Hjalte Tin. Bernd Tesch. Patrcia Govers-Tesch on their visit in 13.05.2010 - Nina and Hjalte in 2010. Fotos B.T. 25.06.2010 - 07.05.2011 First Around the World with electric car 30.000 kms. + Around-The-World by electric car. Nina and Hjalte drove in three continents through 14 differnet countries 30.000 kms with an elchtric-car. Purpose of your tour: ..to test if it was possible to go around the world in a 100% full-size electric car. Route: Europe (Denmark, Norway, Sweden, Estonia) - Asia (Russia (Burjatia), Mongolia (Gobi), China (Erenhot to Shanghai), by container ship to North-America (USA (San Francisco - New York)) - by container ship to Europe (Spain, France, Monaco, Switzerland, Lichtenstein, Austria, Netherlands, Poland, Germany, Denmark). They started with two Nissan Qashqai Electric (Nissan Qashqai converted to 100 electric drive by Danish company Afuture), one driven by Nina, one driven by Hjalte. Technical problems with charging system forced one car to be sent back to Denmark from Moscow. Nina and Hjalte did the rest of the circumnavigation in the other "Green car". Highlights: Joining president Medvediv's summer camp for young inventors outside Moscow. Exhibiting the car at the Shanghai-EXPO and at the Detroit Auto Show. Competing in the Monte Carlo Rally for electric cars (finishing 8 out of 13). Daugther Ida Tin and grandson Elliot Tin joined us in the car in USA from San Francisco to Dallas. The best: To complete the circumnavigation. To cross the Gobi desert. The worst: Weeks of heat-wave in Russia + 40 degrees made charging the car almost impossible. Minus 20 in USA - and no heating to get max. milage to drive from the battery - Brrrr! The World Electric Tour have encountered extreme conditions from endless Siberian highways, Gobi-desert heat, wild traffic in China and freezing US winter. Book or publication :... we are writing a book, expect to be published in 2012. We are producing a TV-program. 26.05.2011 In Aachen Bernd Tesch organised that the EIFELER NACHRICHTEN and AACHENER Zeitung (same owner) interviewed Nina and Hjalte on a party of Bernd Tesch. Out of it came 1 total page: Einmal rund um die Welt und ständig unter Strom. Der Artikel über die erste Weltumrundung eines Elektro-Autos ist recht nett zur Unterhaltung geschrieben. Aber auf die eigentlichen Probleme wurde nicht hingewiesen. Dieses E-Auto hört man ab 3 m nicht mehr und es produziert null Abgase. In Athen, Istanbul, Rom, London und auch in deutschen Städten ersticken die Menschen fast vor Smog. Der Auto-Lärm Tag und Nacht macht das Leben dort unerträglich. Smog- und lärmfreie Städte der Zukunft werden ein ganz anders dimensioniertes Leben ermöglichen ! Der baldige Umstieg auf E-Autos würde auch eine gewaltige Energie-Einsparung bringen. Zwar können diese Autos ganz normal beschleunigen und max 130 km/Std. erreichen. Als energiesparende Durchschnittsgeschwindigkeit hat Hjalte 80 km / h gewählt. Die Todes- und Unfallopfer im Verkehr durch Rasen würden drastisch reduziert. Earlier motorcycle-travel-experiences:.... First time in an electric car. 1999 in an old Citroen 2CV crossing the Himalaya to Ladakh and touring all Pakistan, including the wild Shandur pass from Chitral to Gilgit (300 km in 1st gear). In 2003 again in 2CV from Denmark to Bagdad/Iraq, Turkey, Syria 2 weeks after the fall of Saddam Hussein. 22.04.2011 Hjalte and Nina visited us again. We gave an open fire-party for them. First open fire on the tour for them ! In this time Nina and Hjalte build their own houses which I called "Mongolian Palace". We visited each other several times each other. When they were here they called our house "our German home". 3. To drive an electric car with the technical standard today Around-The-World is not a luxurius tour. Normaly they can drive ca. 200 km with one battery. If they have high voltage (380 V) and charge the battery two times a day they can drive 300 kms per day. Then they have to stop for a few hours to charge the battery. Depending if this is 110 voltage (in USA) or 220 V (Europe) or even 380 V in workshops it takes different hours. The more voltage you have the quicker the batteries are charged. You need different adapters (how many ??) to circle a world. Because all people in the countries and continents felt that Nina and Hjalte are doing a special thing they NEVER had to pay for charging the batteries on the whole trip !! This - of course - they did NOT know before. Of course the have the world.record: "Without paying for energy Around-The-Wolrd". Because they had to save the energy of the batteries for driving they had no energy for "Air-Condition" to heat the car when it was -20°C or to cool down the car when it was plus 40°C outside. So: to develope much better batteries wil be the challenge of the future !! The end of Energy: A nice story happened when they reached us in Hammer - by feet... Driving on 22.04.2011 to Patricia and Bernd Tesch in Hammer the energy of the car-batteries came to a final end. 350 meters before reaching Patricia and Bernd the car stopped on the street "Am Hammerwerk". Just in front of a man Marco Gillessen who was working in his garden: "Can I help you ? You must be the Danish Around-The-World-Travellers who will be on the open-fire-party tonight!". Marco offered them kindly enough energy with a cabel !! This was the other world-record they made: "The only one situation on the whole trip RTW without energy". 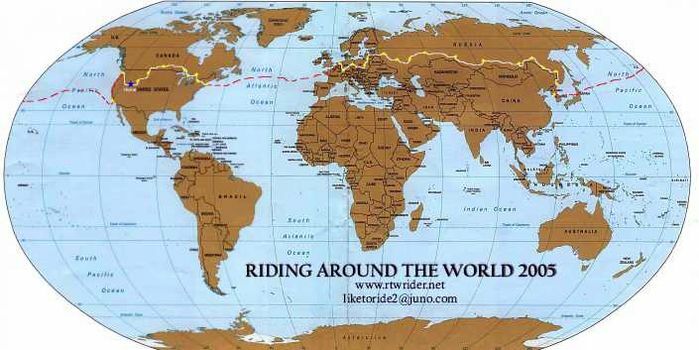 13.02.2013 I found this articel: A "Kabinenroller" circled the world in an 80 days race with 30.000 kms 16 countries: . Foto: Zero Emission Race "Kabinenroller" mit 350 km Reichweite. Tobias Wülser und Frank Loacker. Race: In 80 Tagen mit einem Elektrofahrzeug 30.000 Kilometern ohne CO2-Emissionen um die Welt: Das Schweizer Oerlikon Solar Racing-Team konnte mit dem E-Mobil Zerotracer das Zero Emission Race für sich entscheiden. Vier Elektromobile starten, drei kamen nach einem Rennen um den Globus an. Berliner Vectrix Team. Das südkoreanisches Elektroauto Power plaza EV schied unterwegs aus. Elektrofahrzeug. s, das seine Teilnehmer durch 16 Länder führte, auf dem Place des Nations ins Ziel. Noch nie zuvor ist es glungen, mit einem Elektrofahrzeug eine so große Distanz innerhalb von 80 Tagen zurückzulegen. The Worst: Frost. Schnee. Regen. Hitze. Schotterpisten. Schlechte Straßen mit großen Schlaglöchern. Das Kabinenmotorrad basiert auf einem Kevlar-Monocoque, wie es auch in der Formel 1 verwendet wird. Aufgrund seiner hohen aerodynamischen Effizienz (Cw-Wert 0,18) und dem leistungsstarken Elektroantrieb kann es der Zerotracer in puncto Beschleunigung mit nahezu jedem Sportwagen der Welt aufnehmen. Die Hochleistungsbatterie ermöglicht dem Elektrofahrzeug eine Reichweite von bis zu 350 Kilometern. Dank Schnellladetechnik ist die Batterie innerhalb von 30 Minuten zu 80 Prozent geladen. Für eine vollständige Ladung benötigt der Zerotracer unter zwei Stunden. Durch das Rennen konnte demonstriert werden, dass in der Entwicklung von Fahrzeugen, die durch erneuerbare Energien angetrieben werden, stetig Fortschritte gemacht werden. 13.02.2013 First info by Paul Blezard. 1970 Start of search of Travellers Around-The-World by motorcycle. 1992 - 1994 More intensive search because of my book "Motorrad Abenteuer Touren" in work by phone, fax and personal visits. 1995 - 1997 First tries to find and contact RTW-Travllers and Motorcycle-Travellers by email. 28.05.2000: Start of this collection first time in internet under > http://www.berndtesch.de > German or Engl. version > continents > world > by motorcycle. 21.08.2004: Visitor: 100.000 Ulrich Stiller. 18.01.2003-21.08.2004 = 25.000 visitors in 364 + 124 + 90 + 3 Tage = 581. Entspicht 25.000 visitors : 581 days = 43 visitors / day. 25.04.2005 ... Visitor 110.460. Umittelbar nach dem 47. Motorrad-Fernreise-Treffen 22.-14-04.2005. 06.10.2005 ... Visitor 116.859. 2 Wochen nach Installation eines neuen Computers wegen Viren. Around-The-World by car, on food, by bicycle, in a baloon, by sailing-boat. See my other sites.